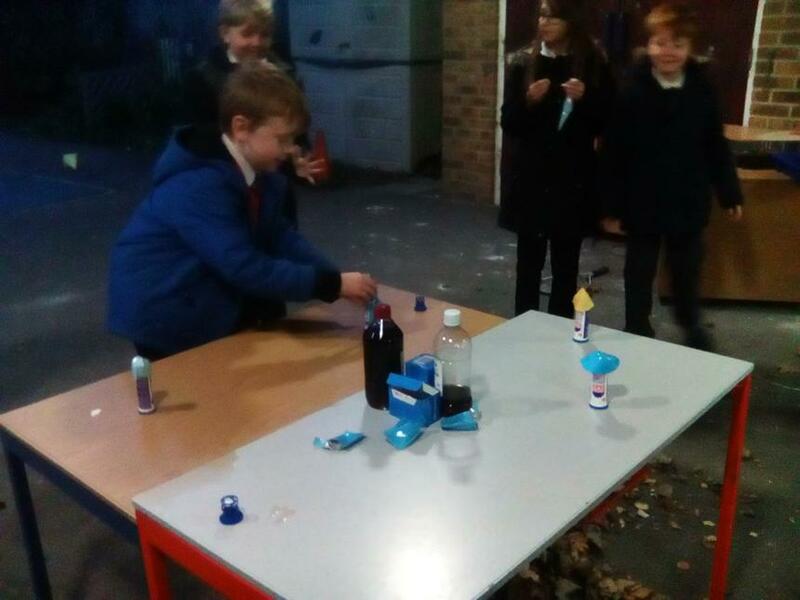 In this experiment, we created our very own rockets! 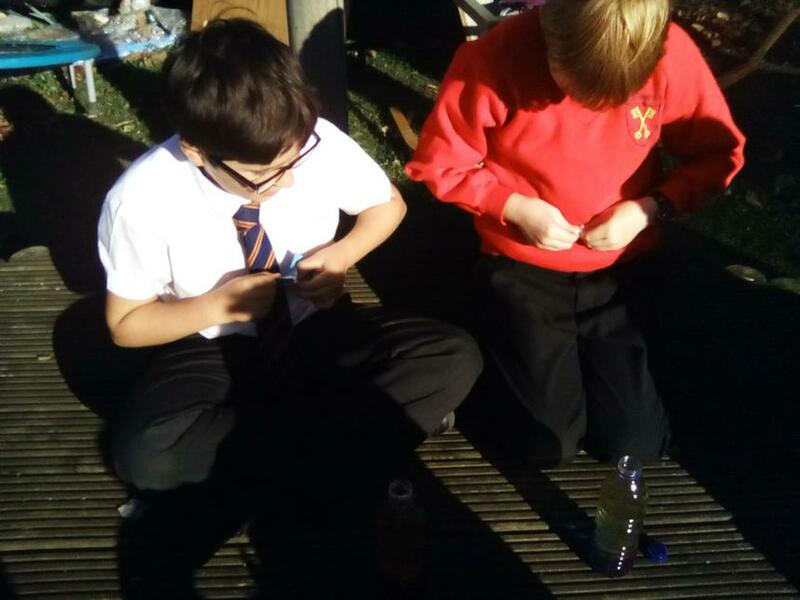 Our rockets were powered by the reaction that occurs between vinegar (acid) and Alka Seltzers (alkali). 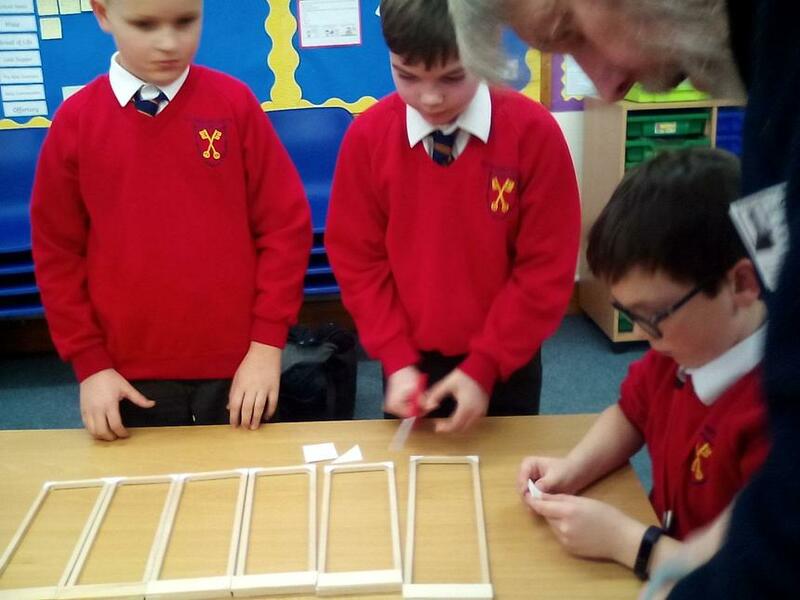 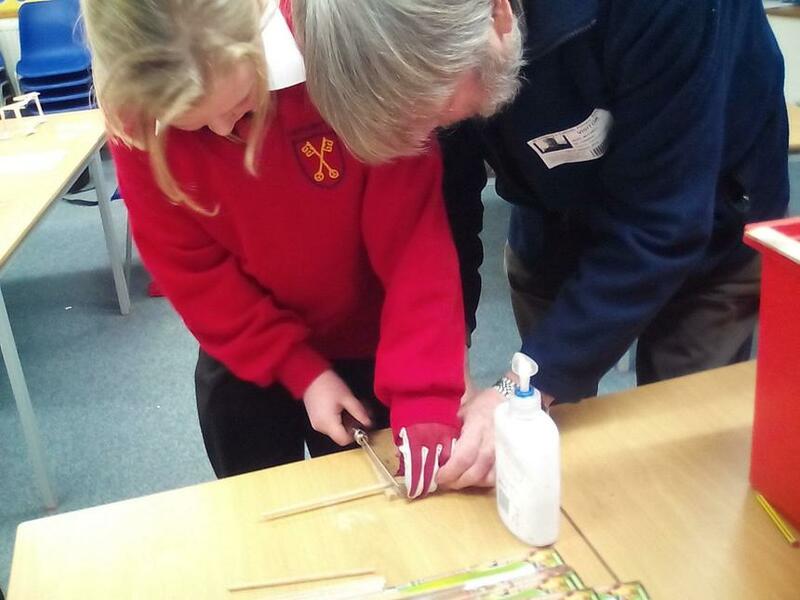 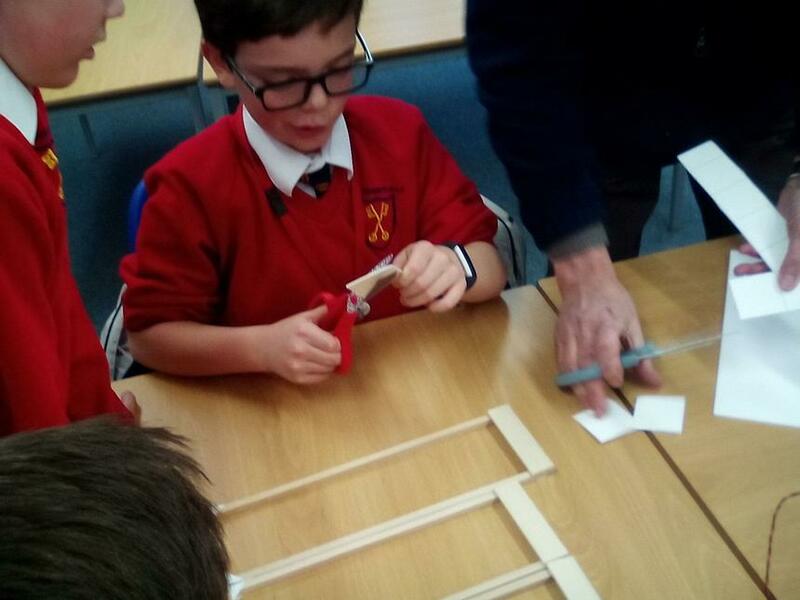 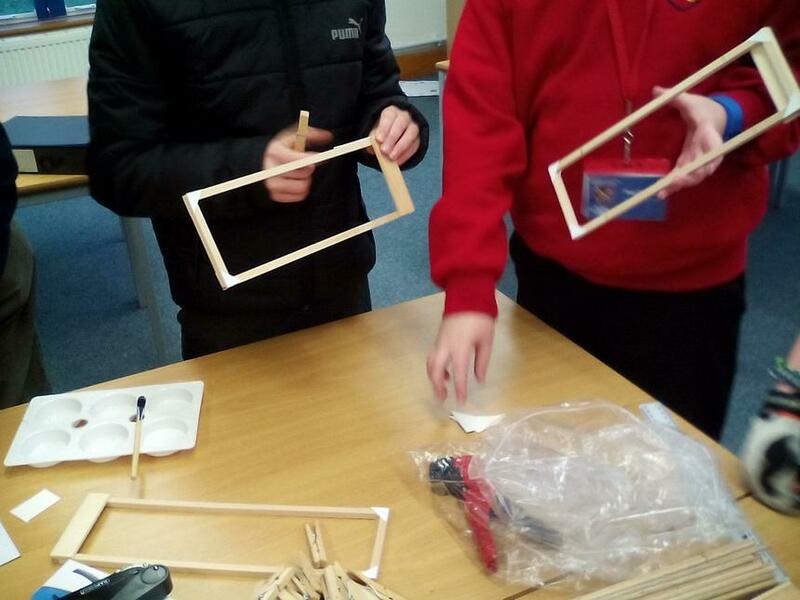 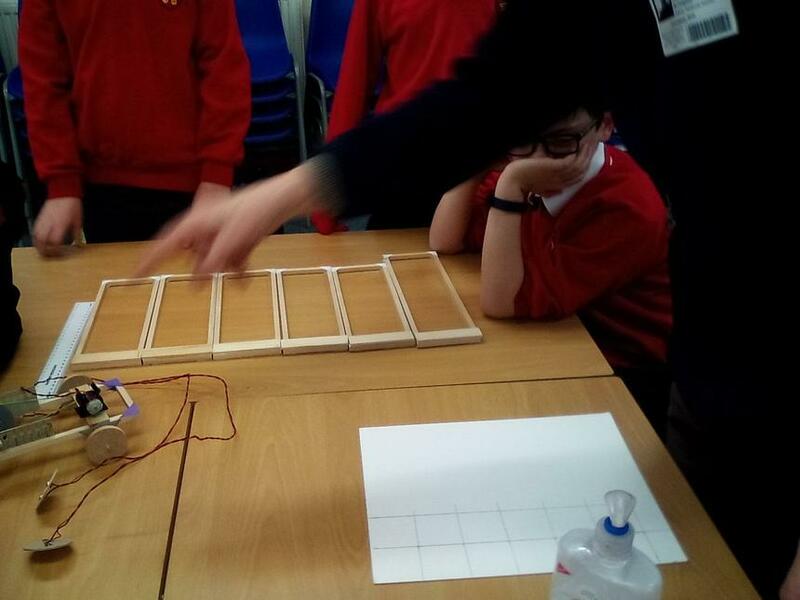 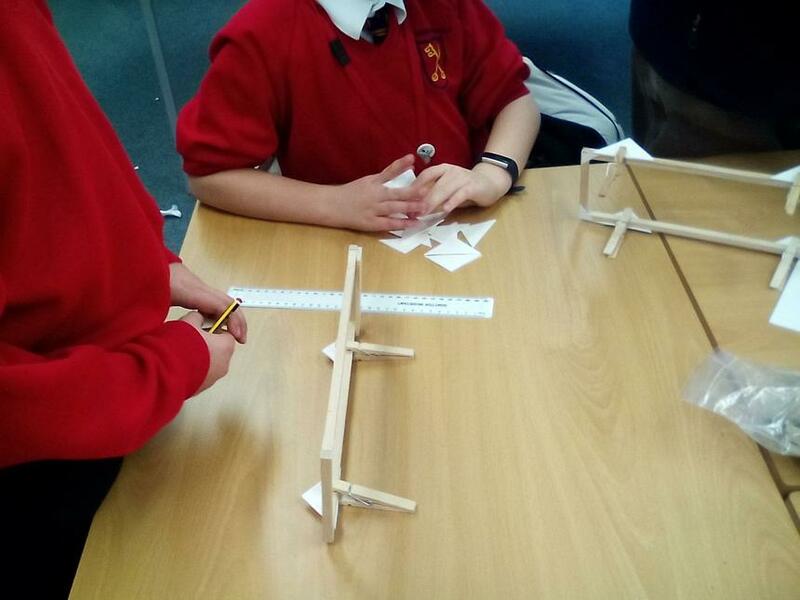 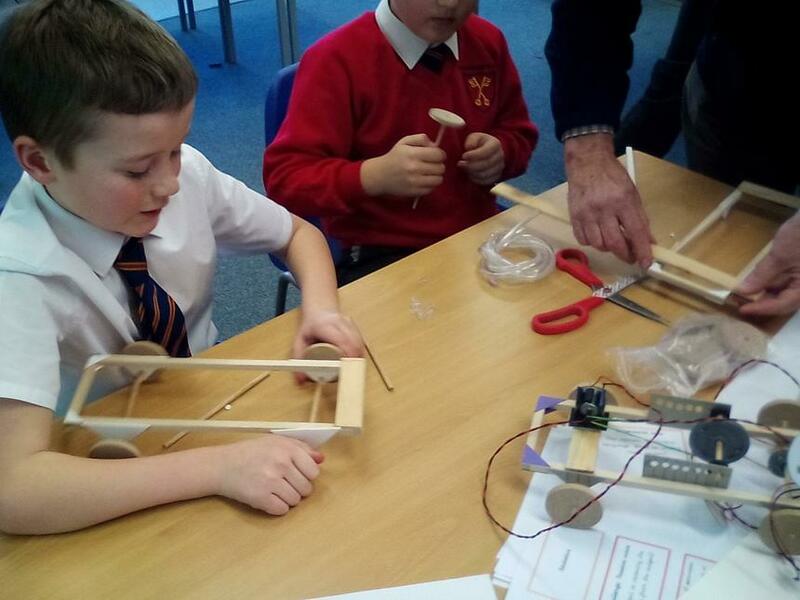 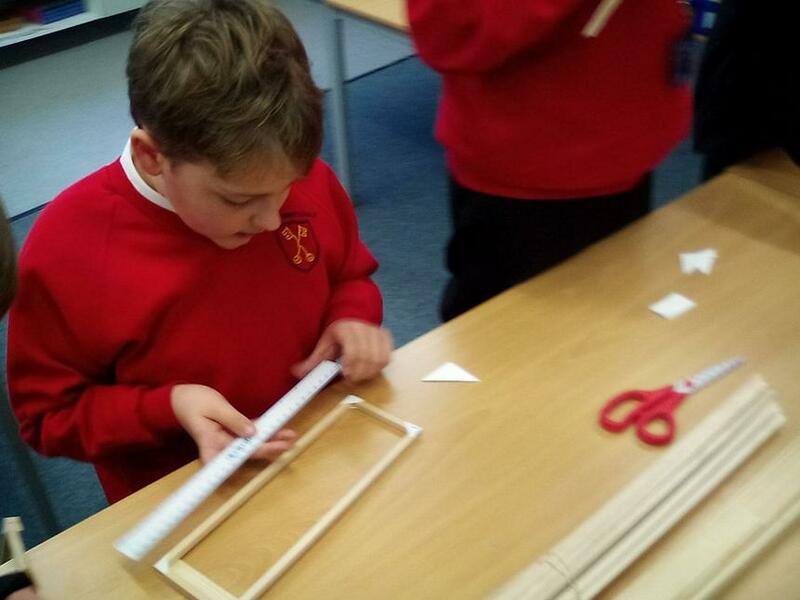 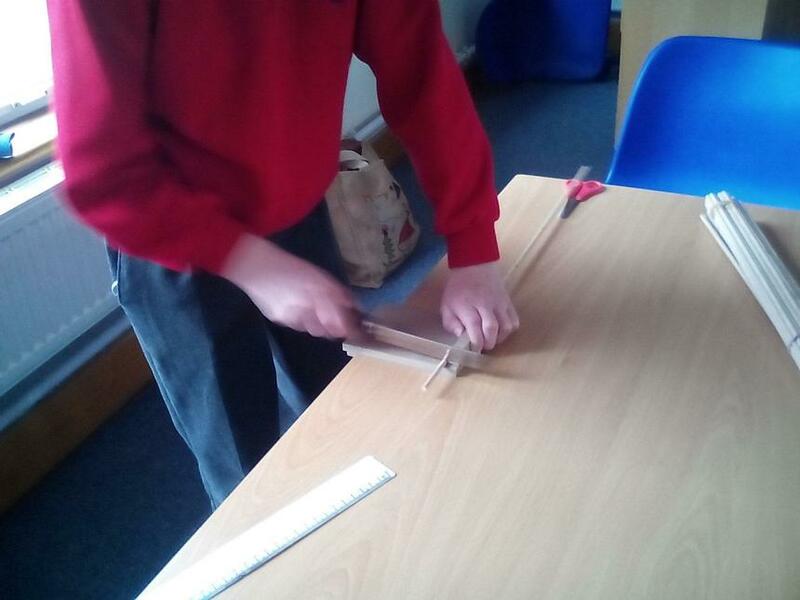 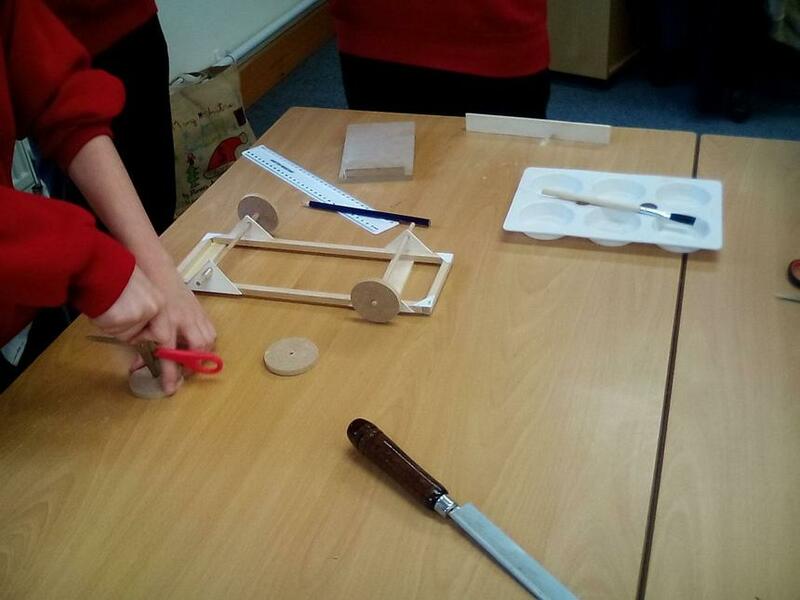 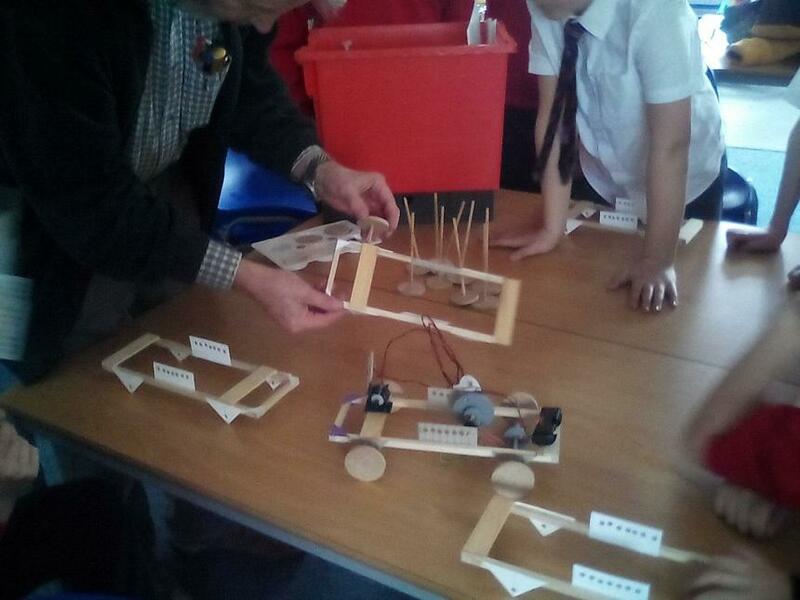 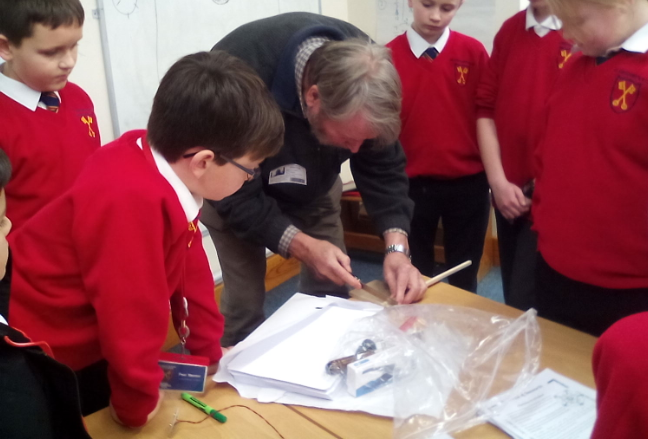 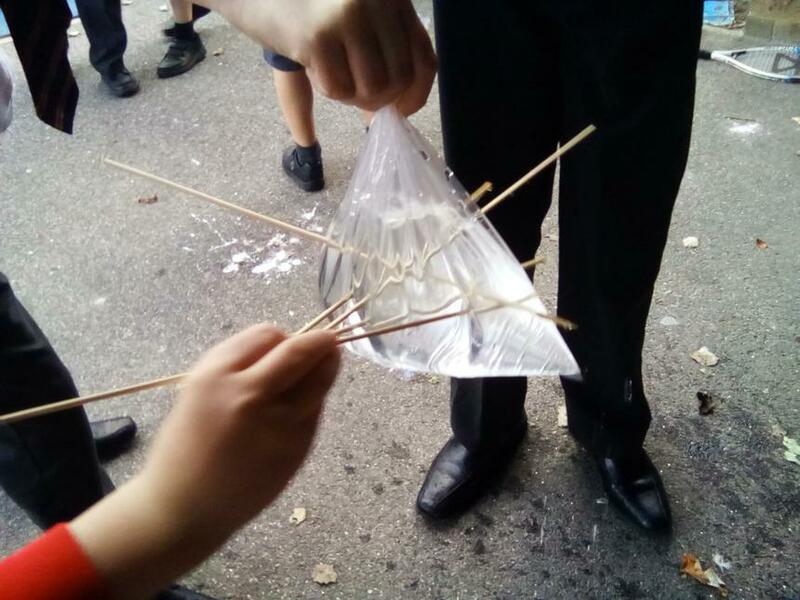 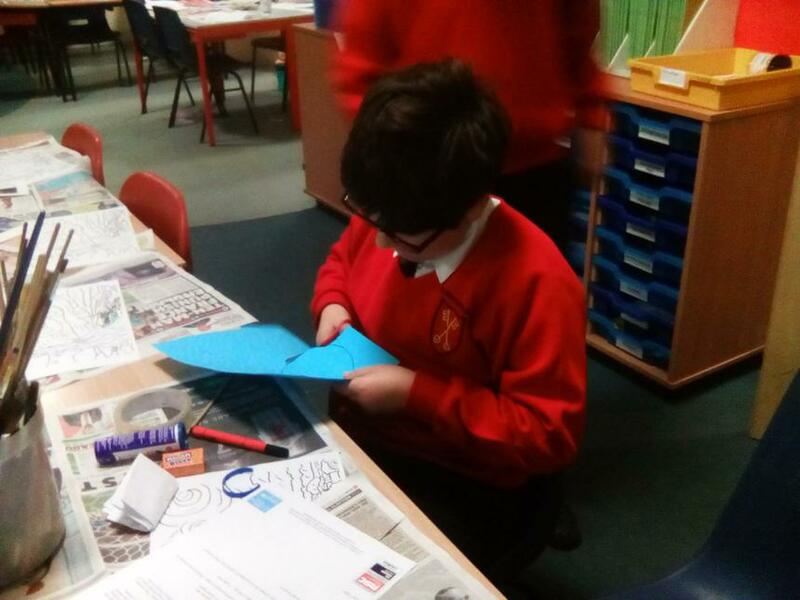 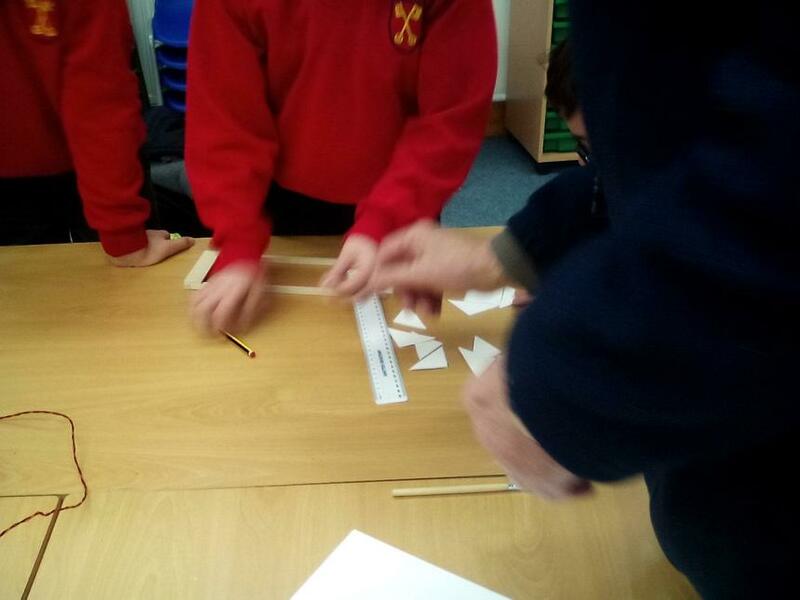 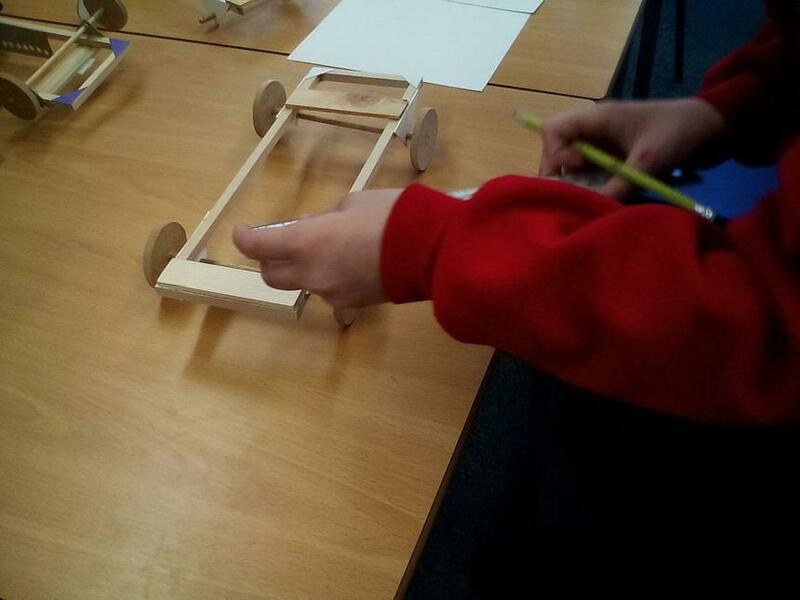 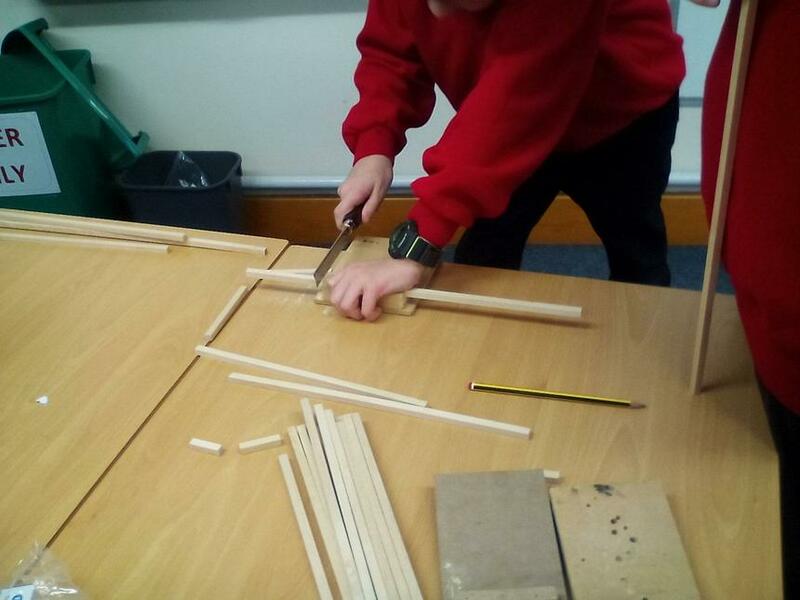 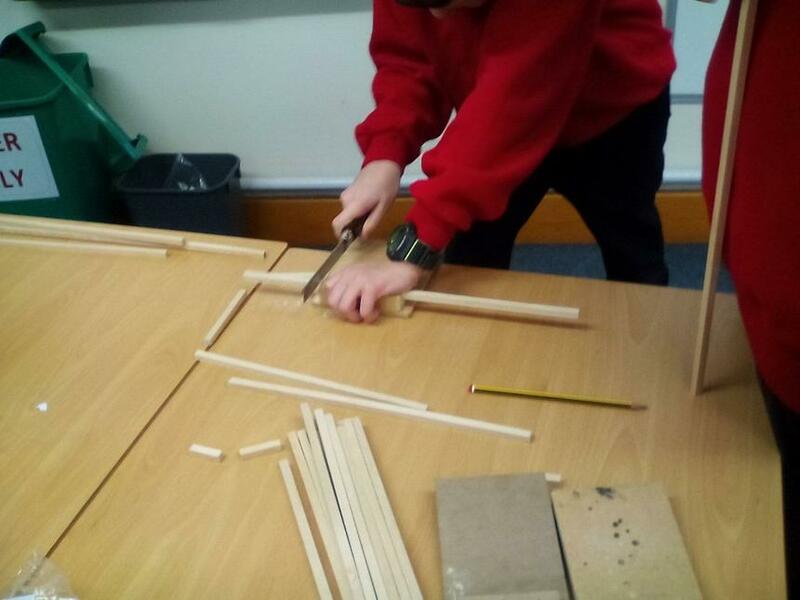 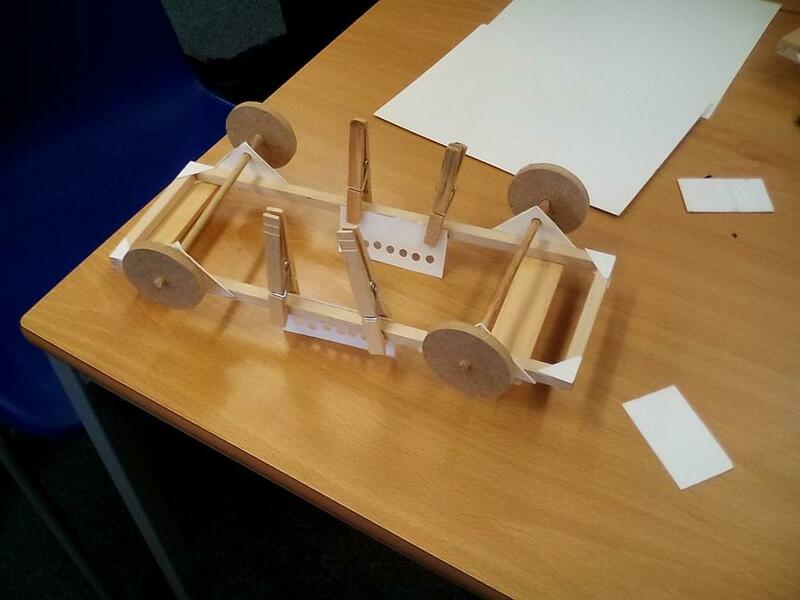 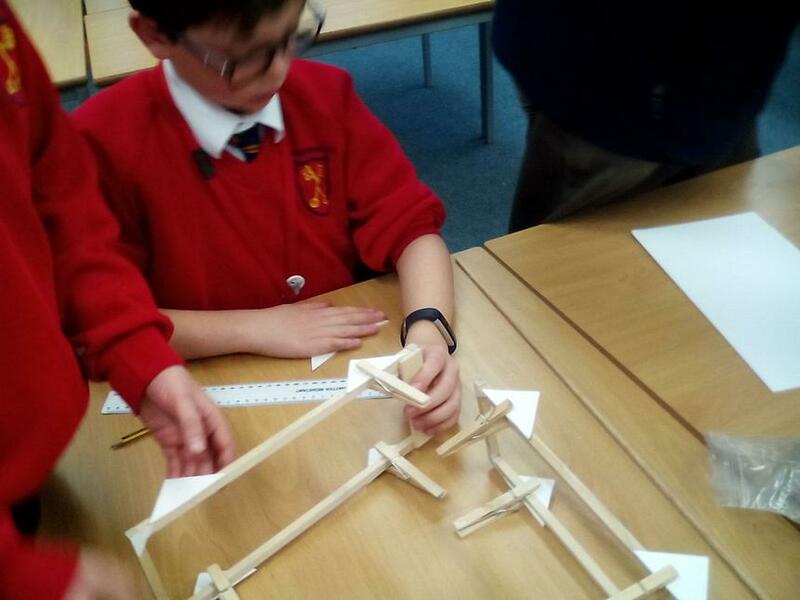 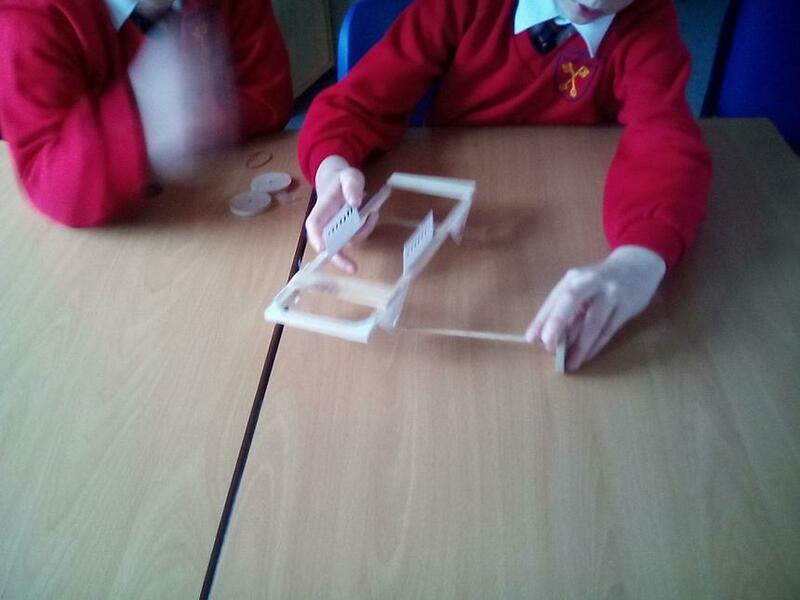 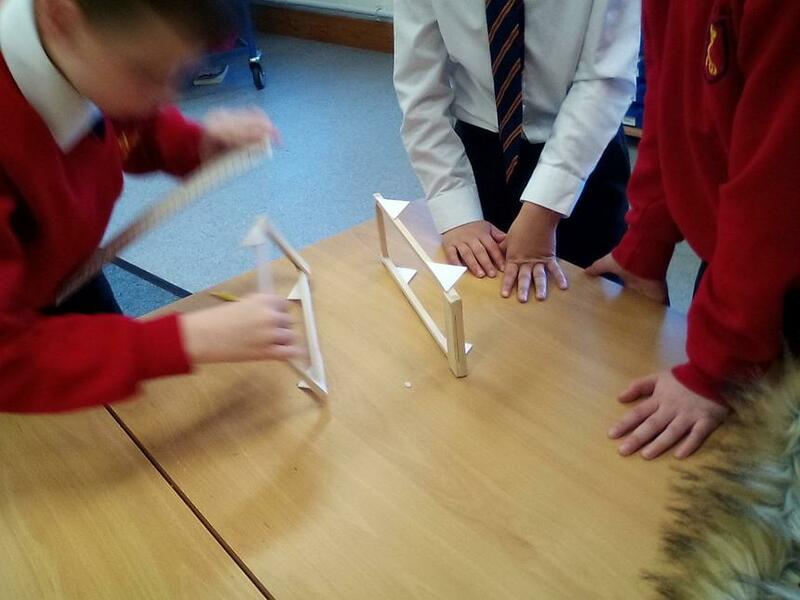 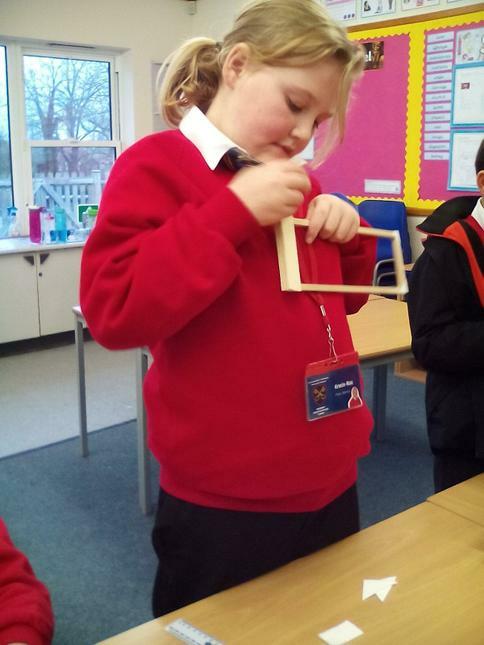 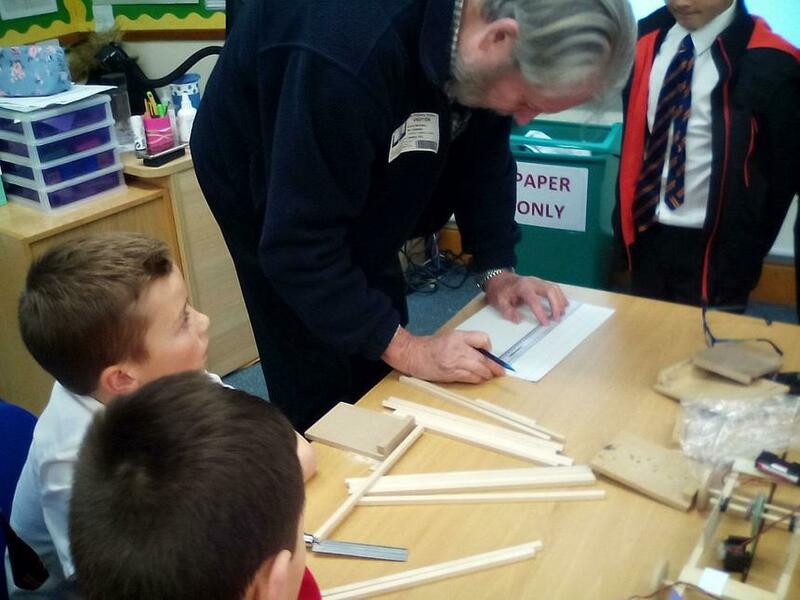 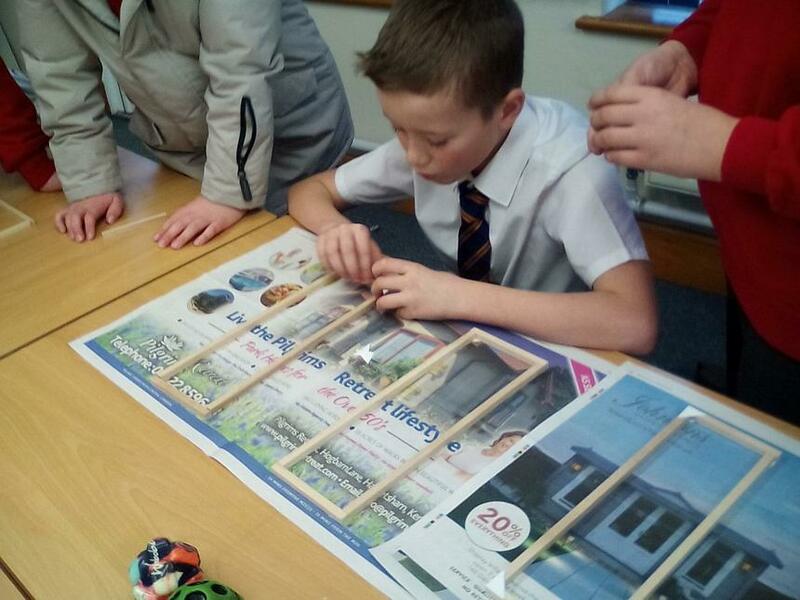 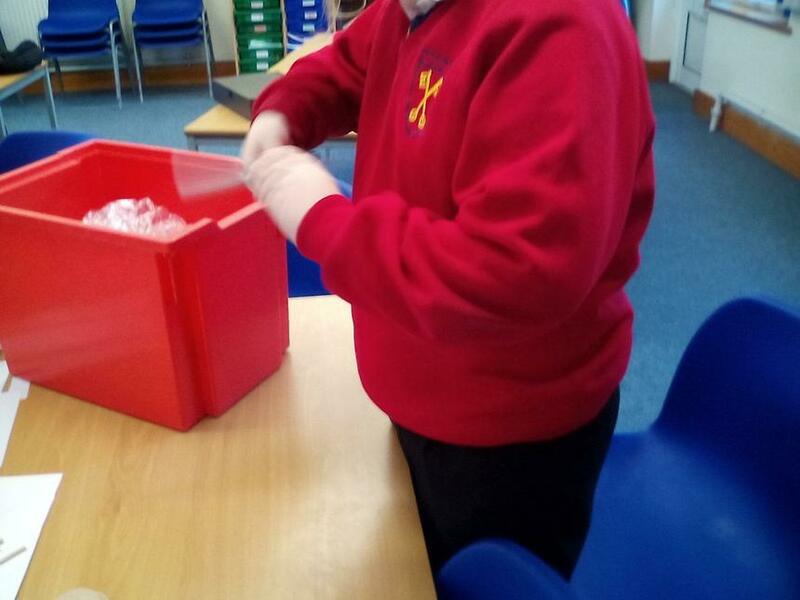 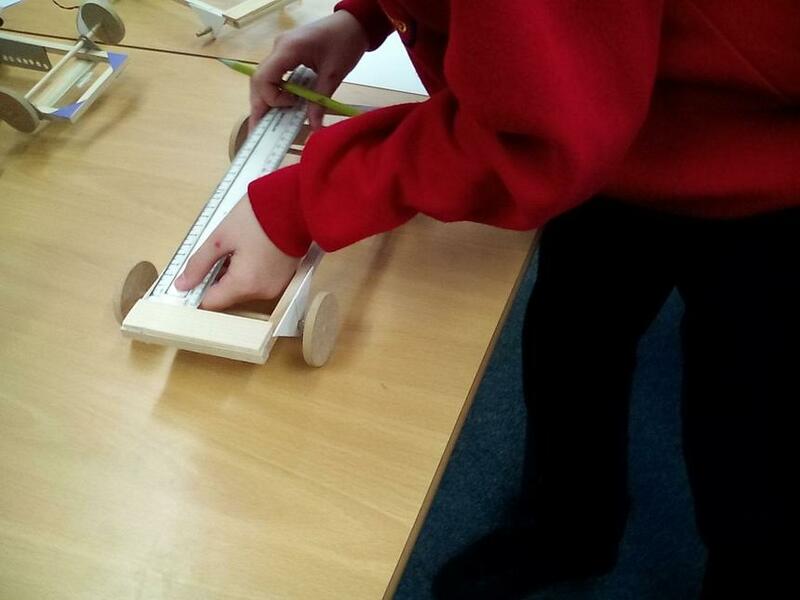 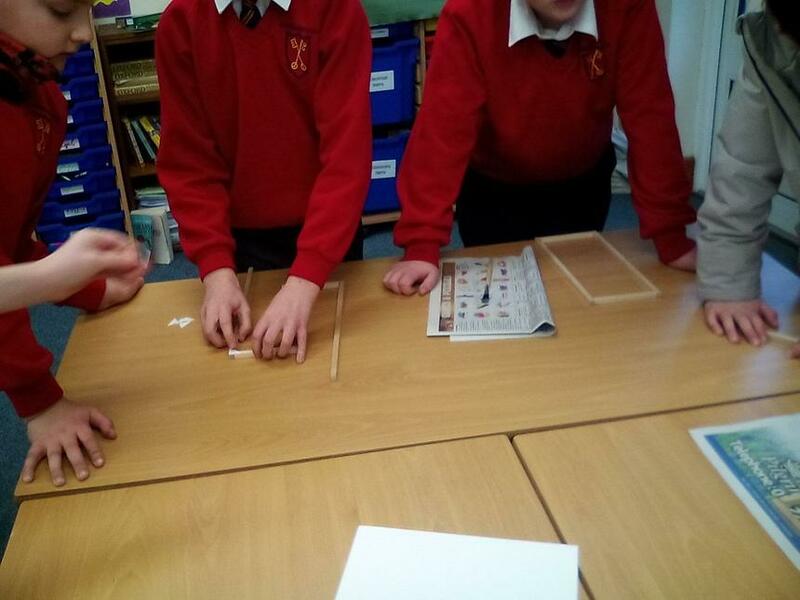 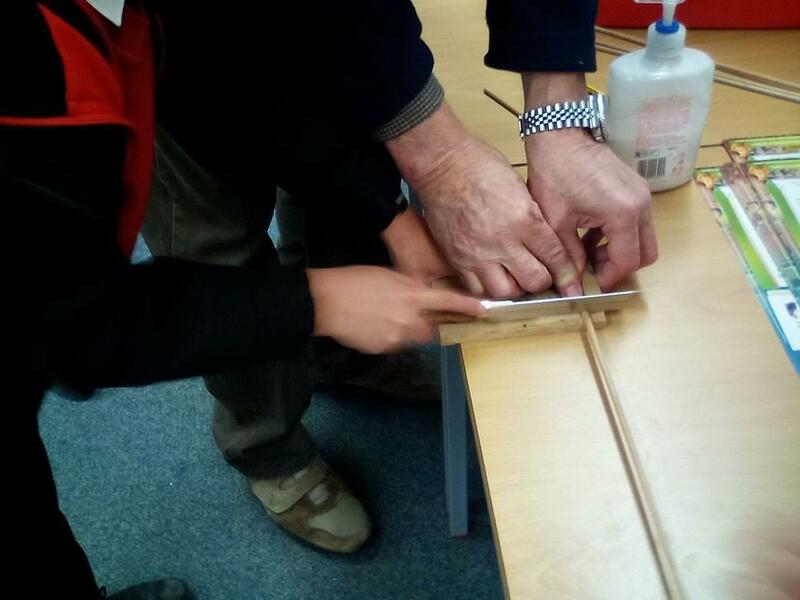 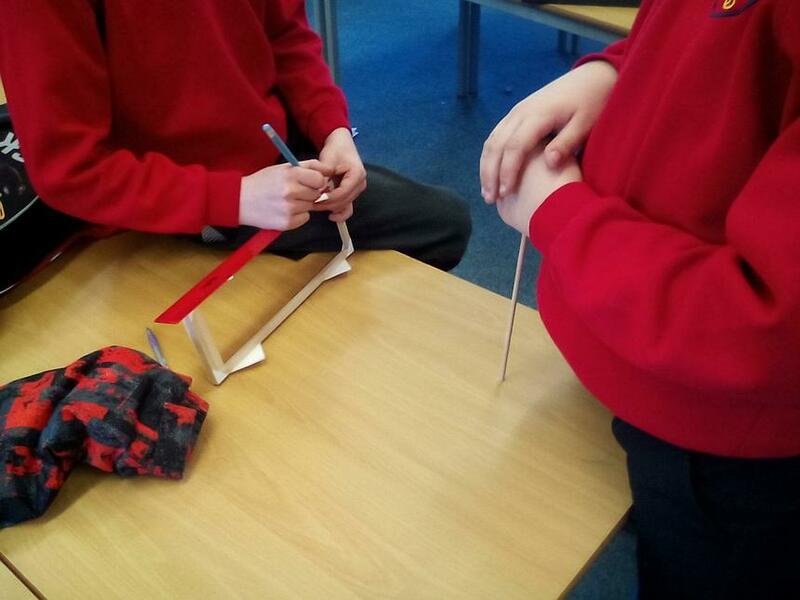 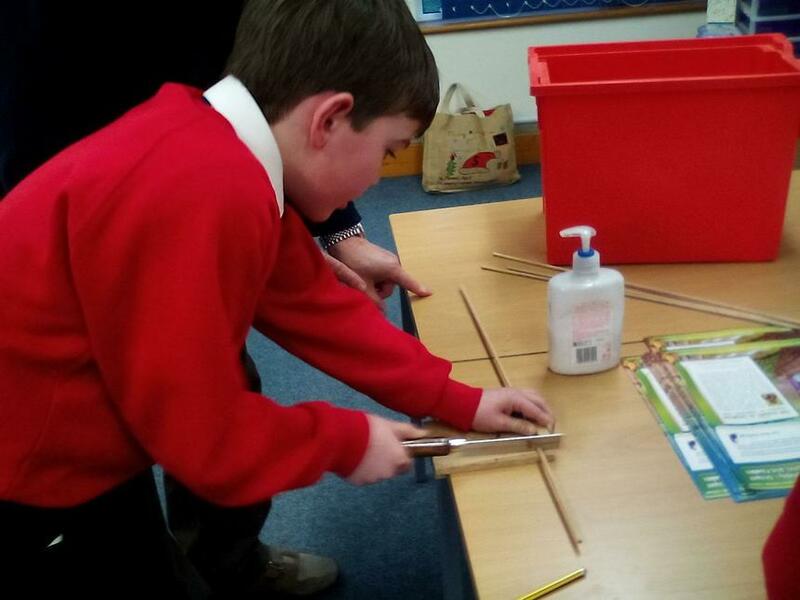 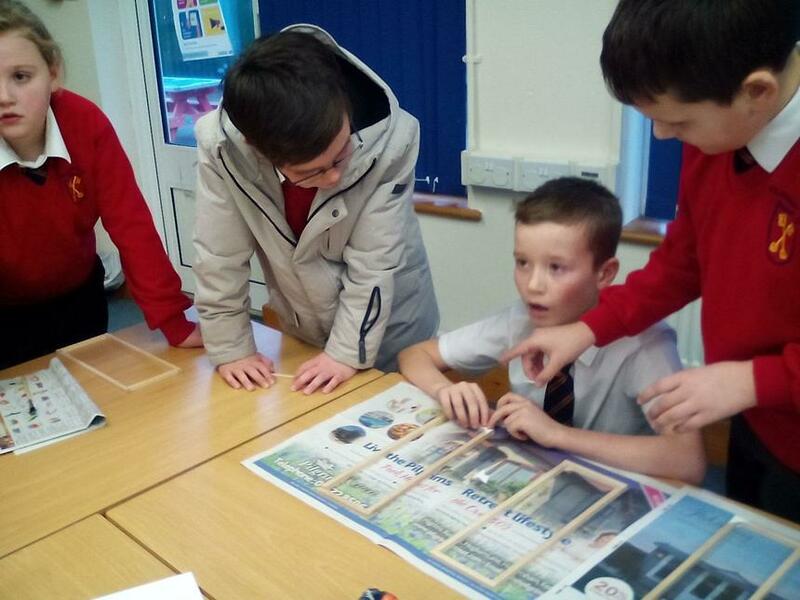 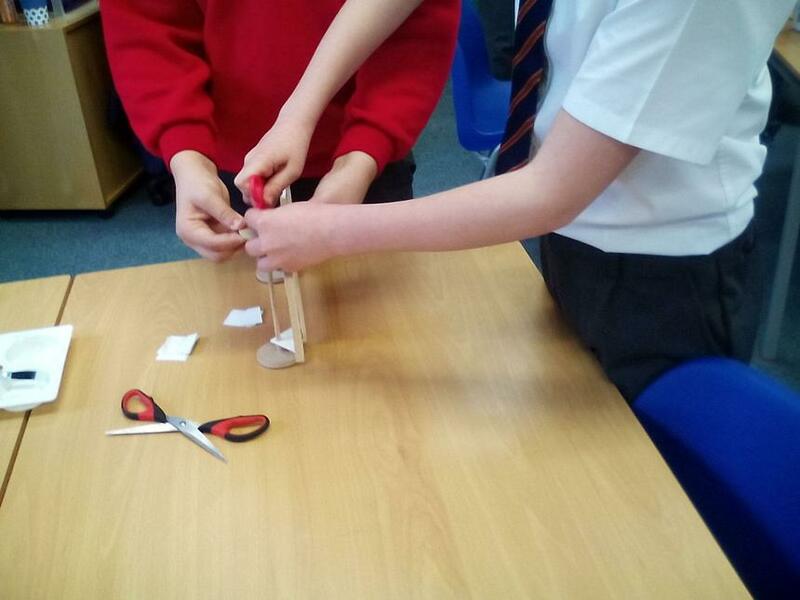 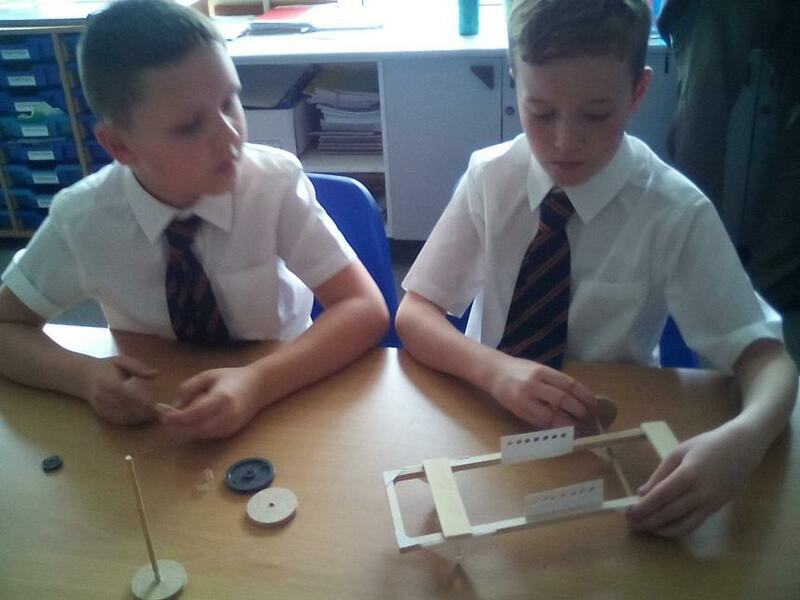 Firstly, we had to make our rockets as streamline as possible to reduce air resistance. 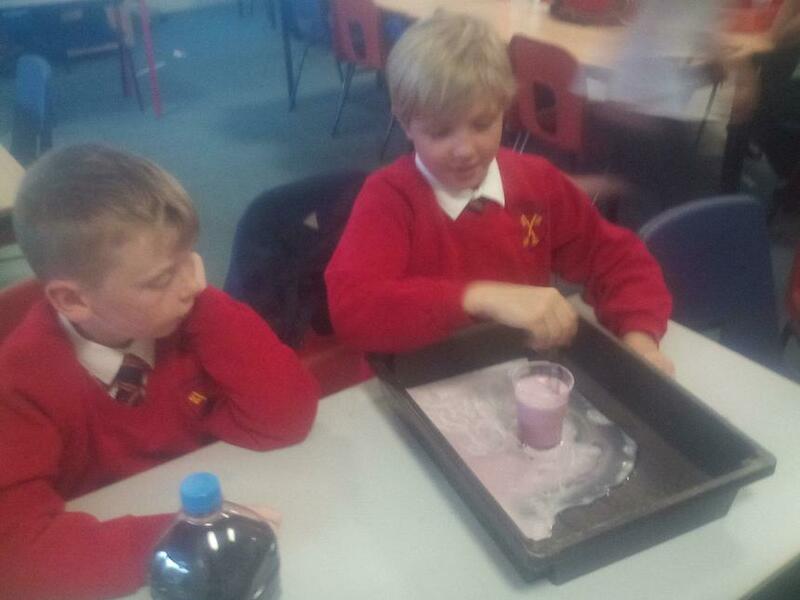 We then added our “rocket fuel”, quickly put the lid on and waited for lift off! 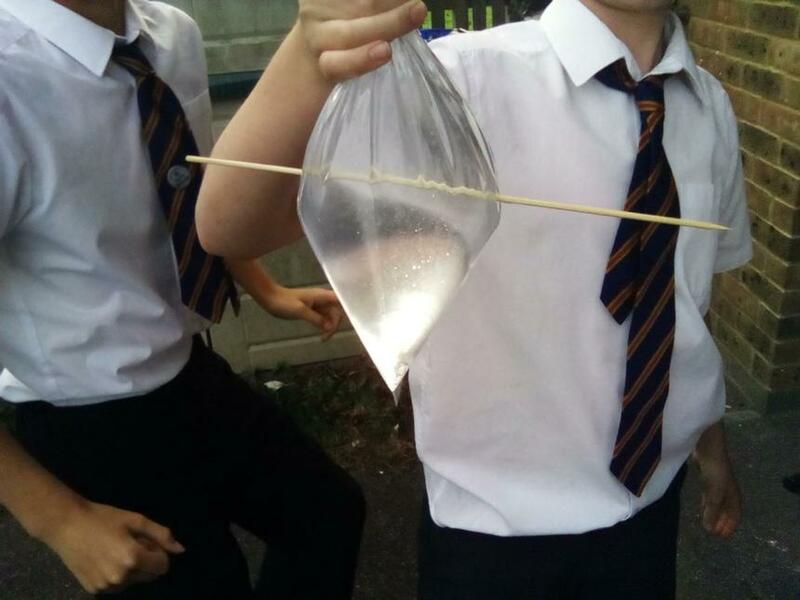 As the vinegar and Alka Seltzer reacted together, a gas (Carbon Dioxide) was given off which caused the pressure to build up in the rocket. 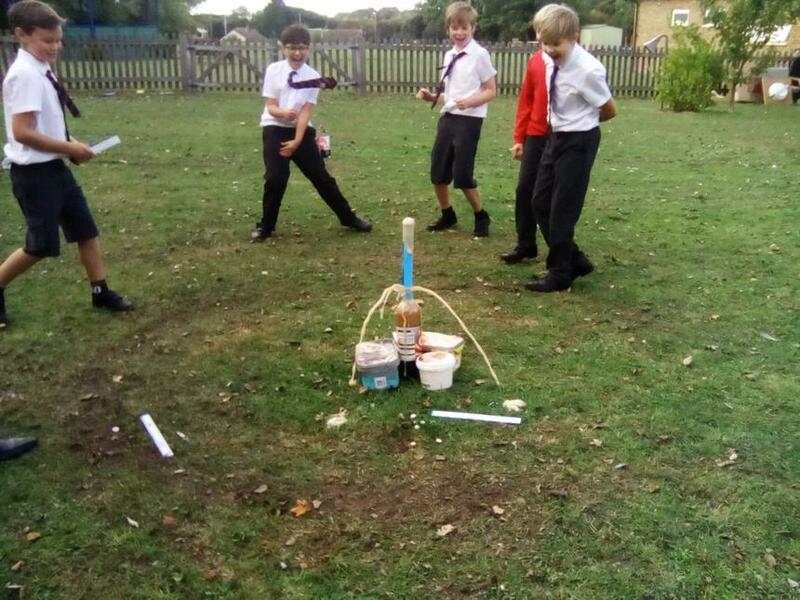 When the pressure became too much, the lid popped off and the rocket was fired into the air! 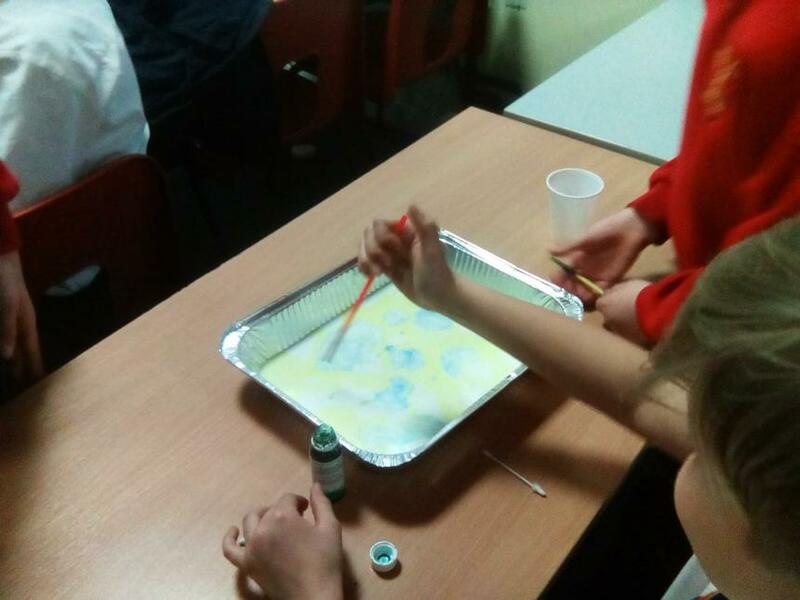 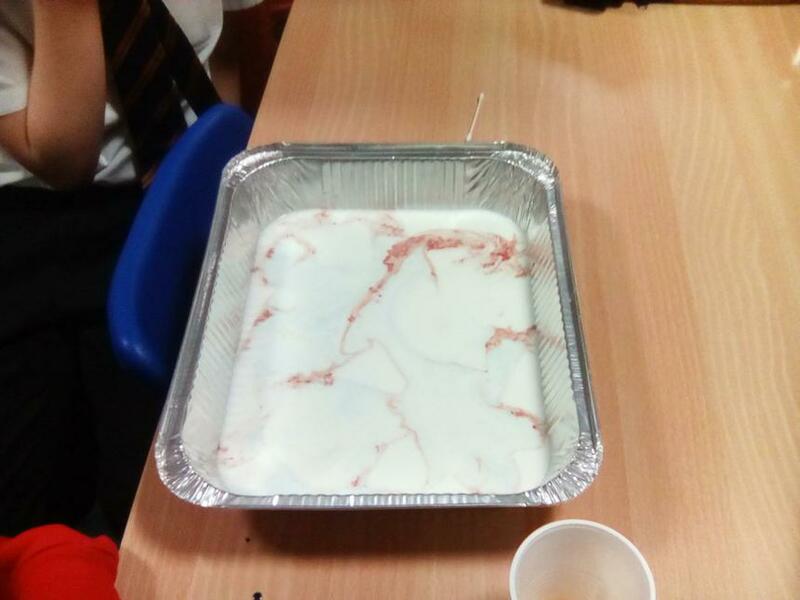 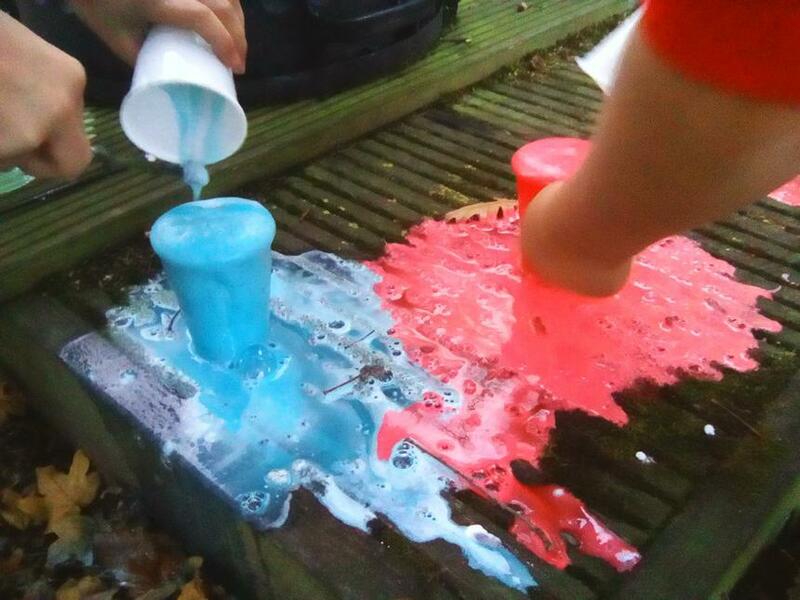 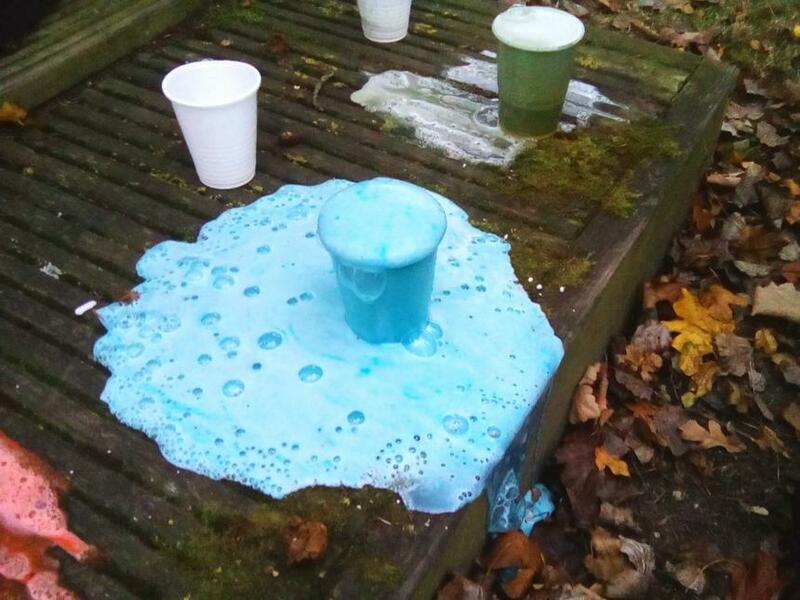 This week, we mixed milk, food colouring and washing up liquid to create magic milk. 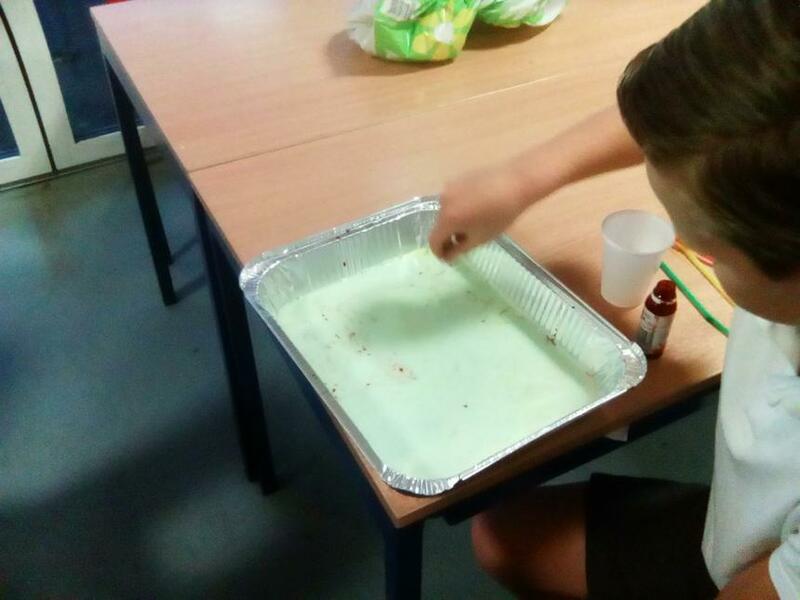 First of all, we added some drops of food colouring to a tray full of milk. 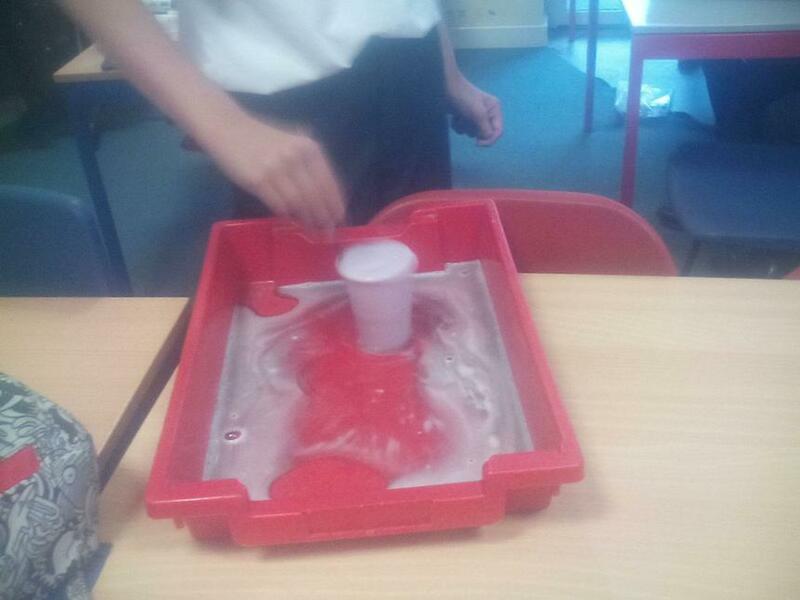 Next, we used a cotton bud to gently drop some washing liquid onto the surface of the milk. 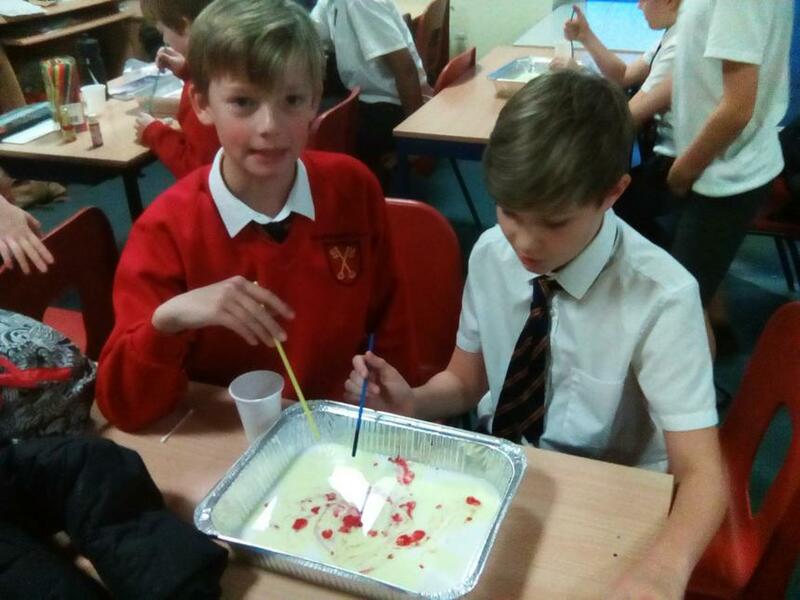 This lowered the surface tension on the milk and caused the food colouring to “jump” out of the way! 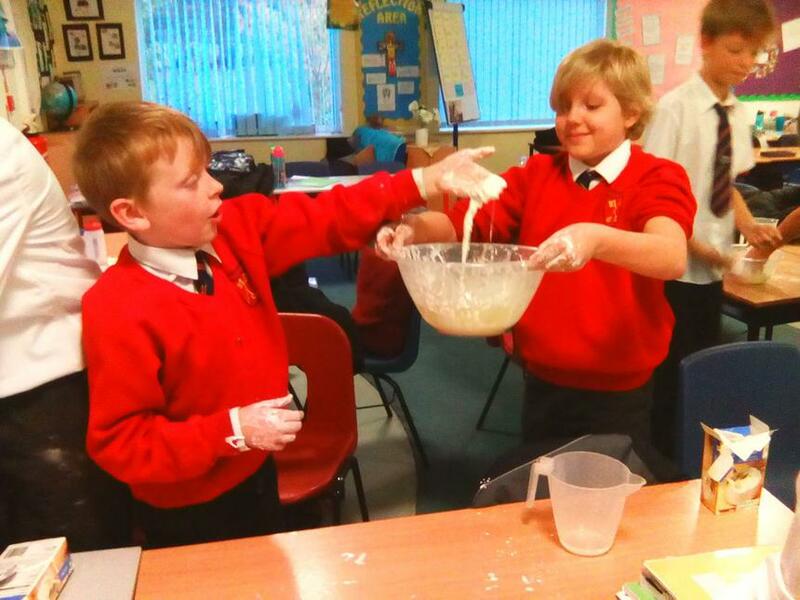 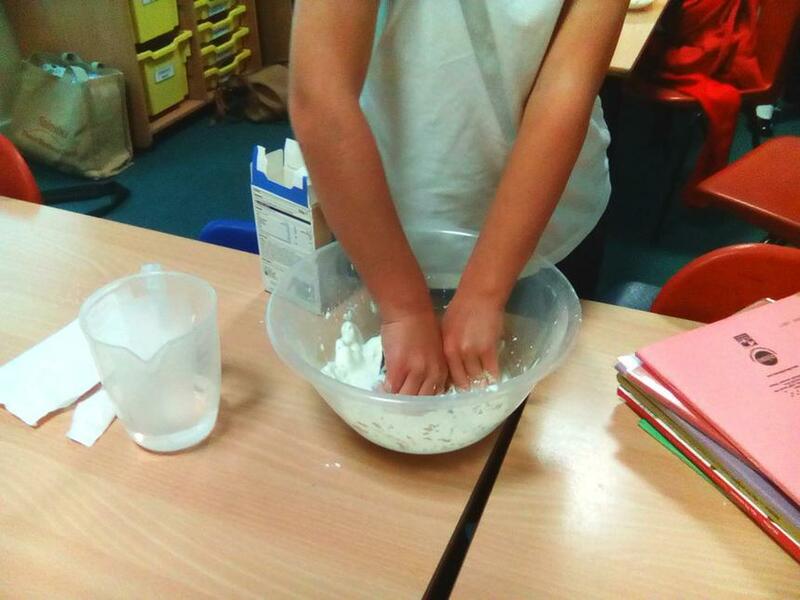 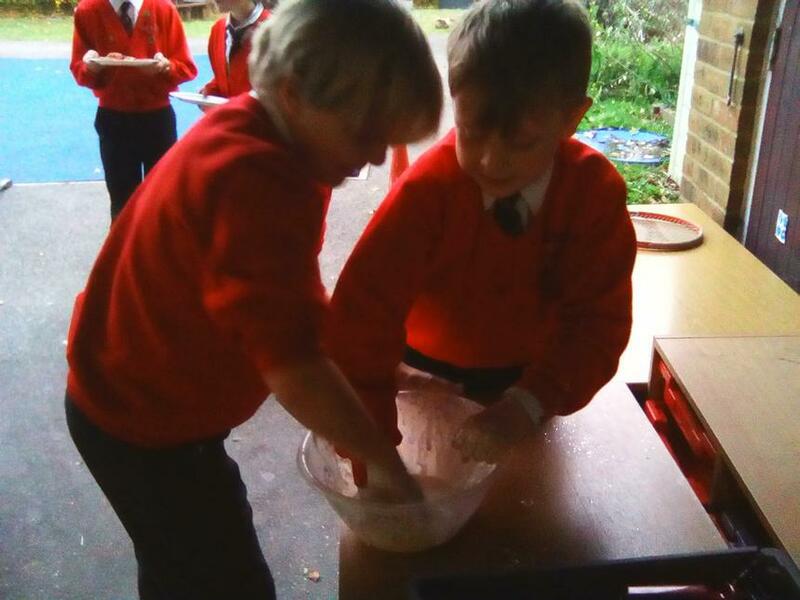 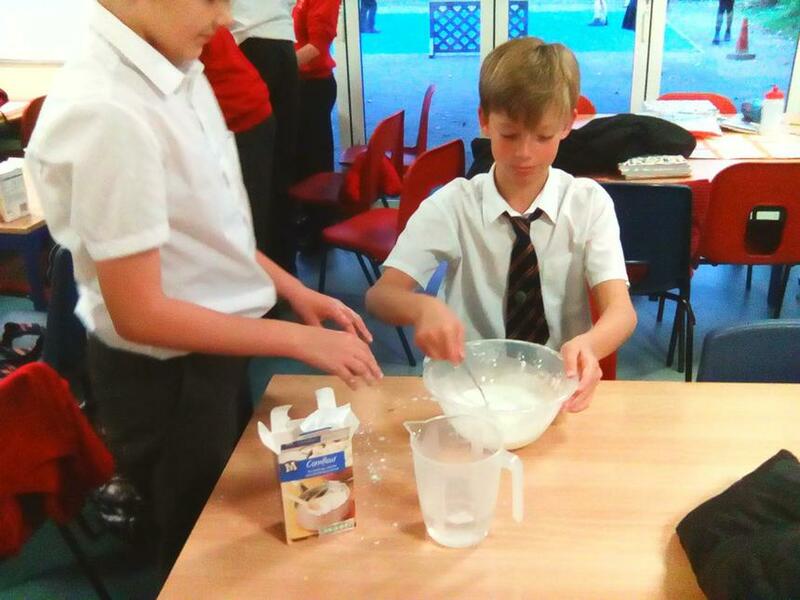 In this experiment, we added cornflour to water to produce a really strange result! 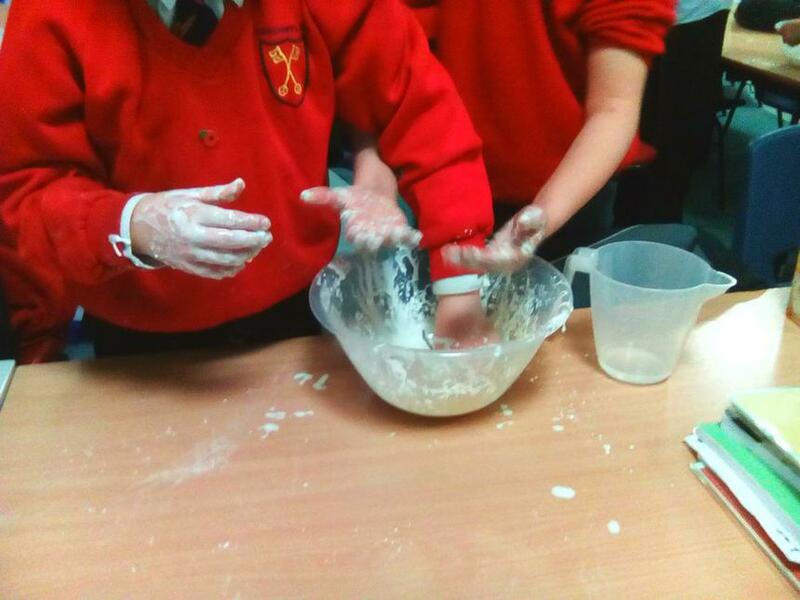 We produced a non-Newtonian fluid. 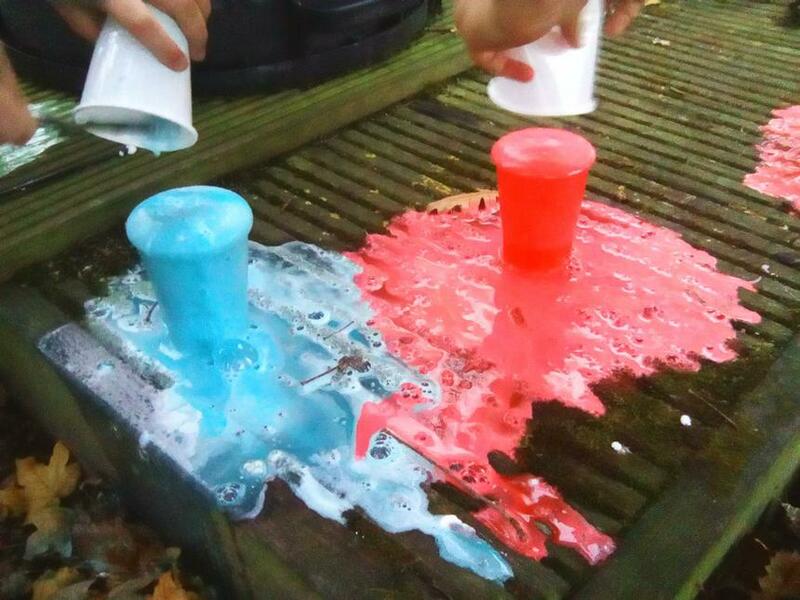 This is when the mixture acts likes a liquid but it also acts like a solid under certain conditions as well. 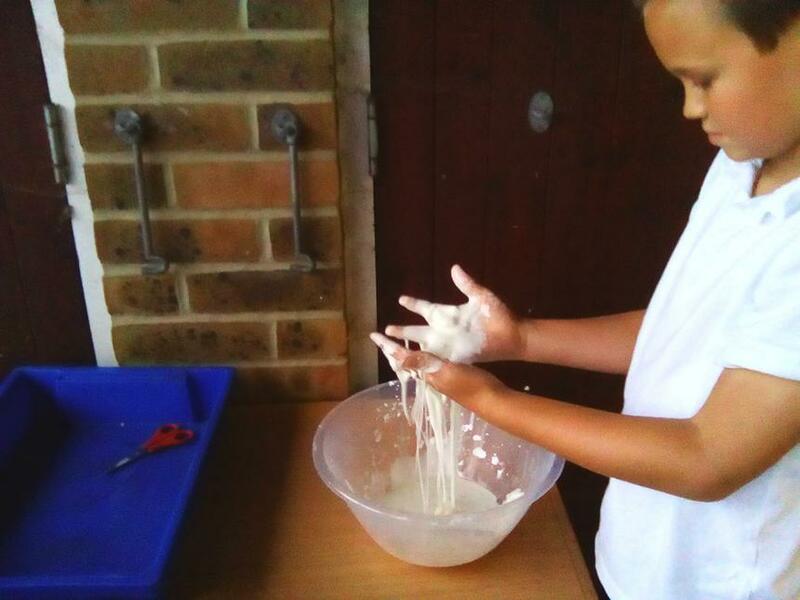 We had great fun playing around with our non-Newtonian fluid and also made a lot of mess! 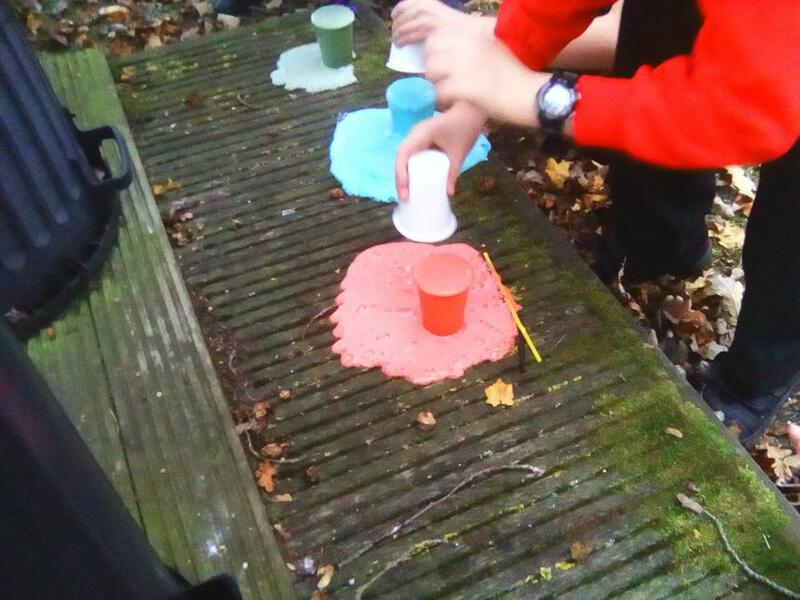 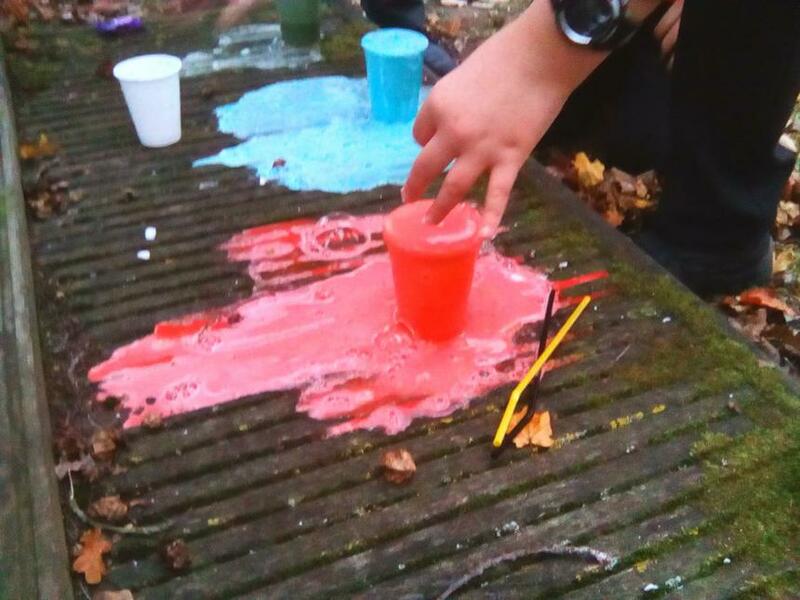 This week, we made colourful, exploding volcanoes. 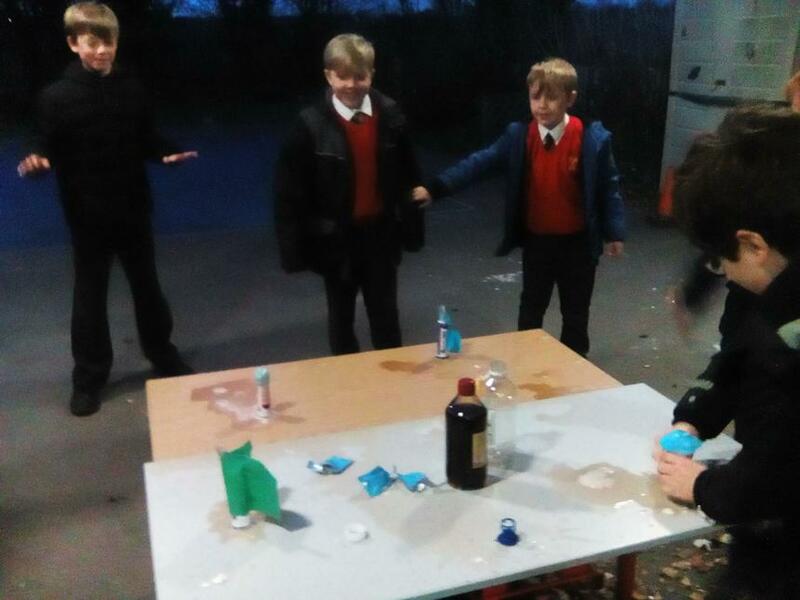 We mixed bicarbonate of soda with vinegar to produce a violent reaction. 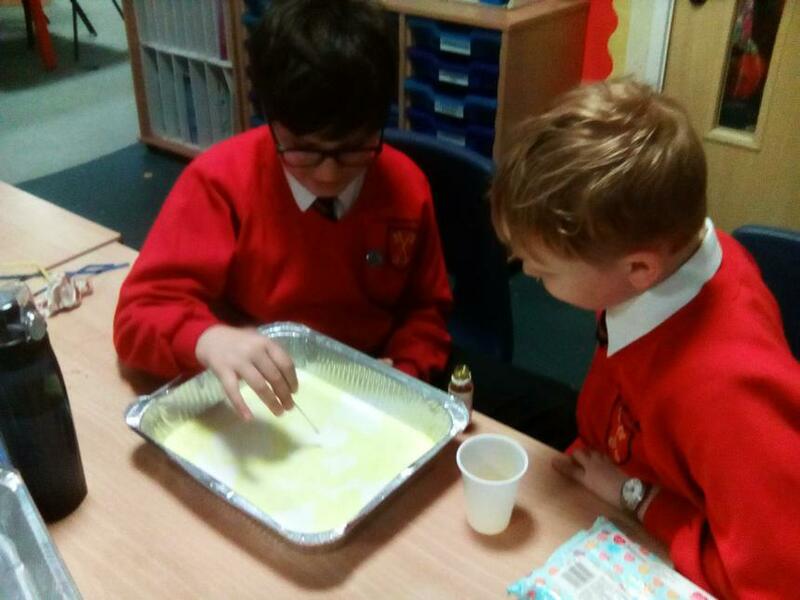 The bicarbonate of soda acts as the alkali and the vinegar acts as the acid. 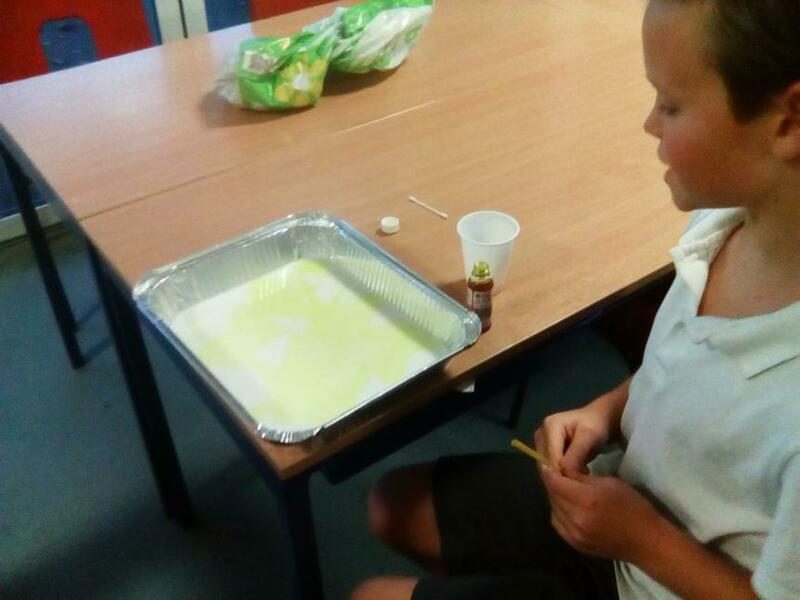 These react together to give off carbon dioxide (a gas) to produce the bubbling, foaming effect. 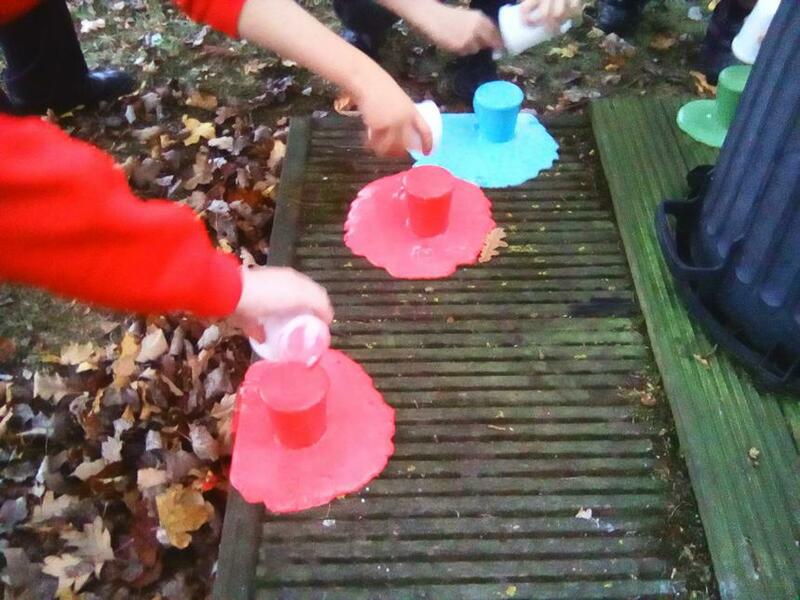 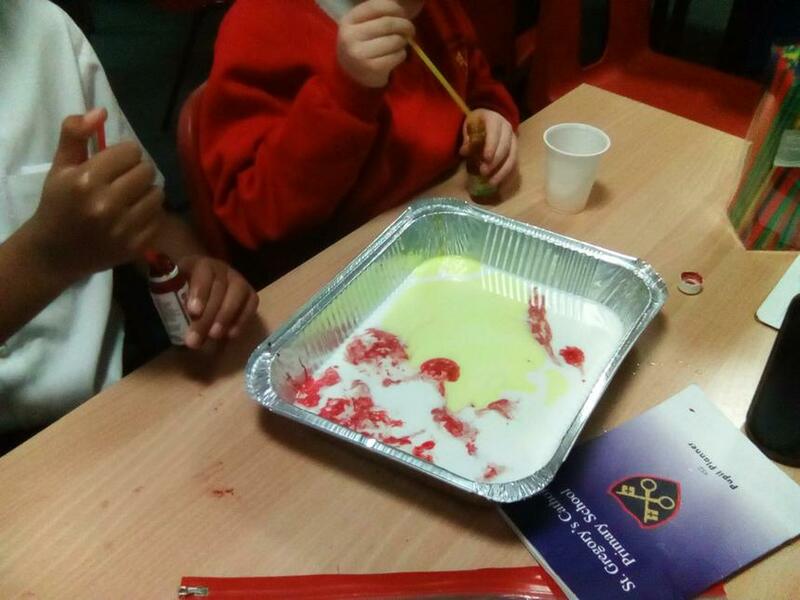 To make our volcanoes colourful, we added some paint as well. 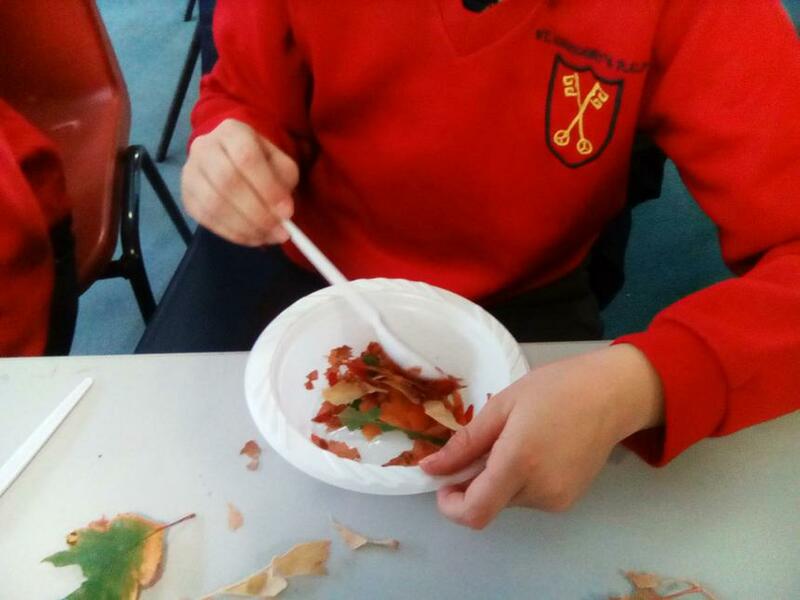 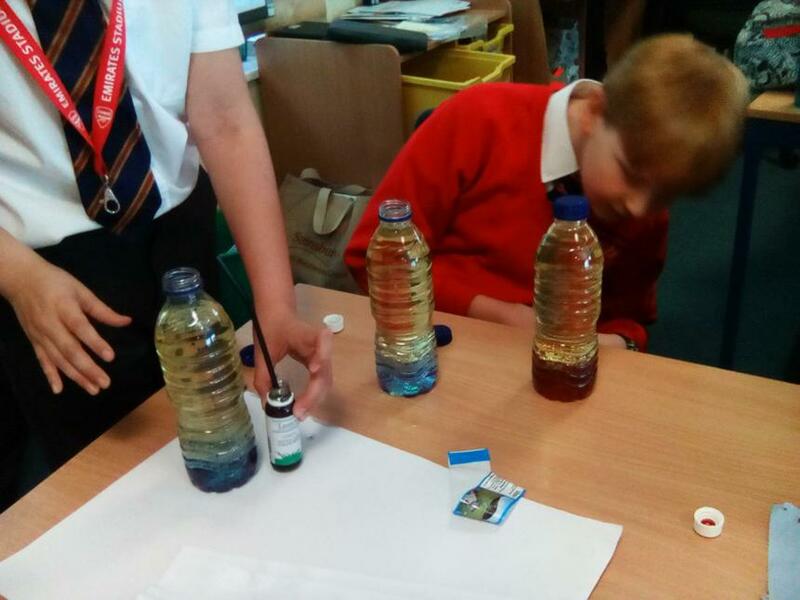 In our first experiment we used the process of chromatography to separate the pigments (colours) found in a variety of leaves. 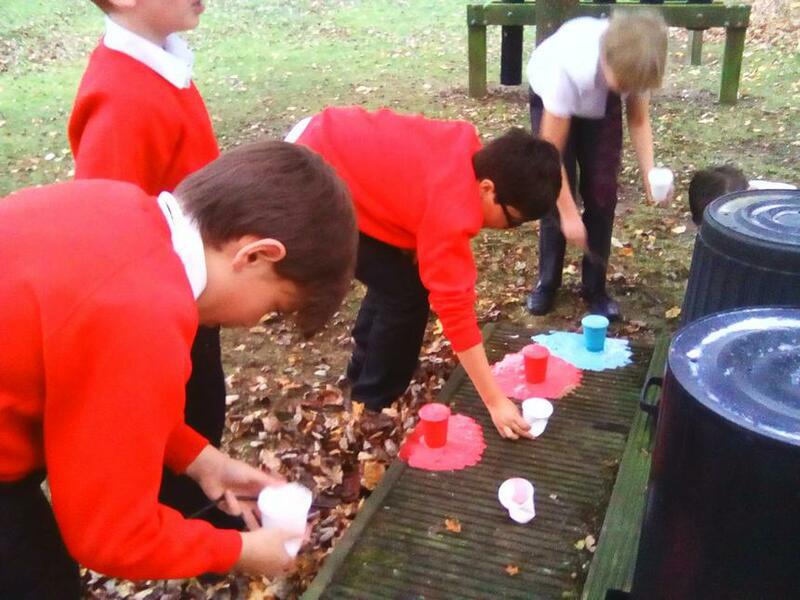 We had to use acetone as the solvent to enable the pigments to travel up the filter paper. 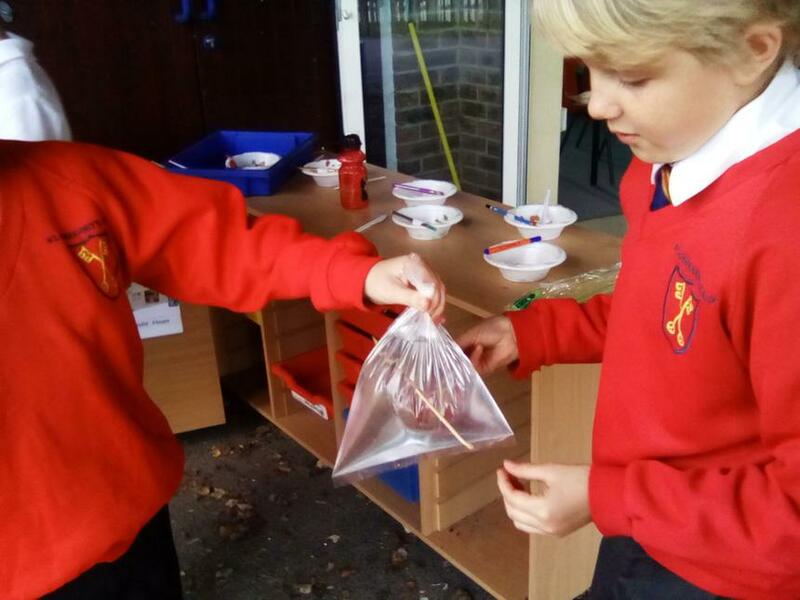 In our second experiment we investigated the “magical plastic bag” that didn’t leak even after we had poked lots of skewers through it! 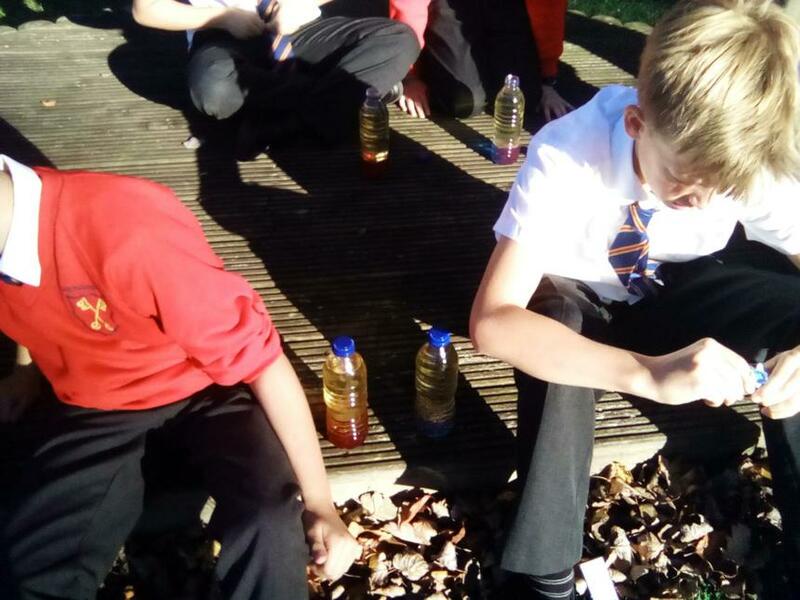 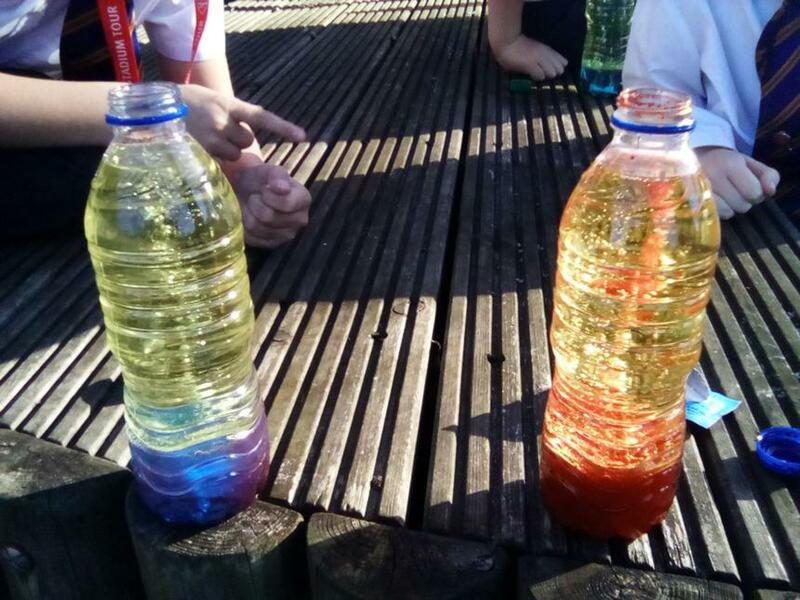 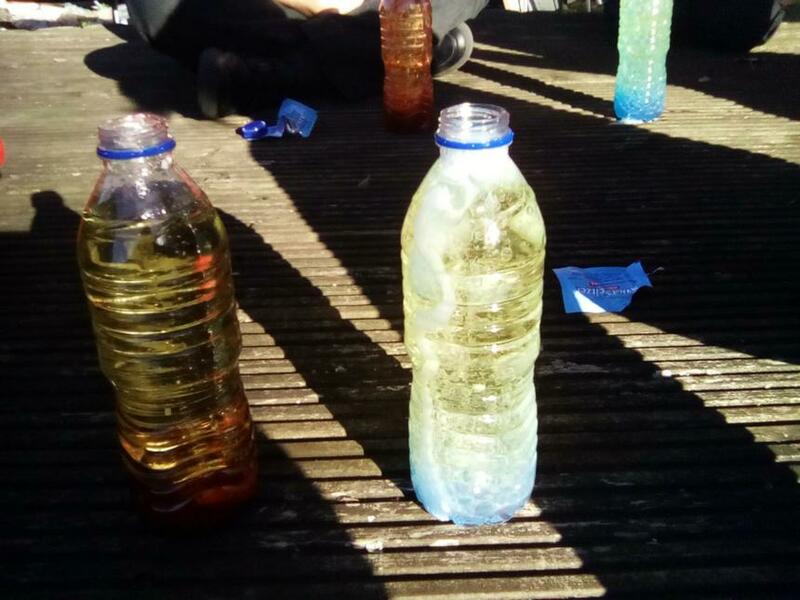 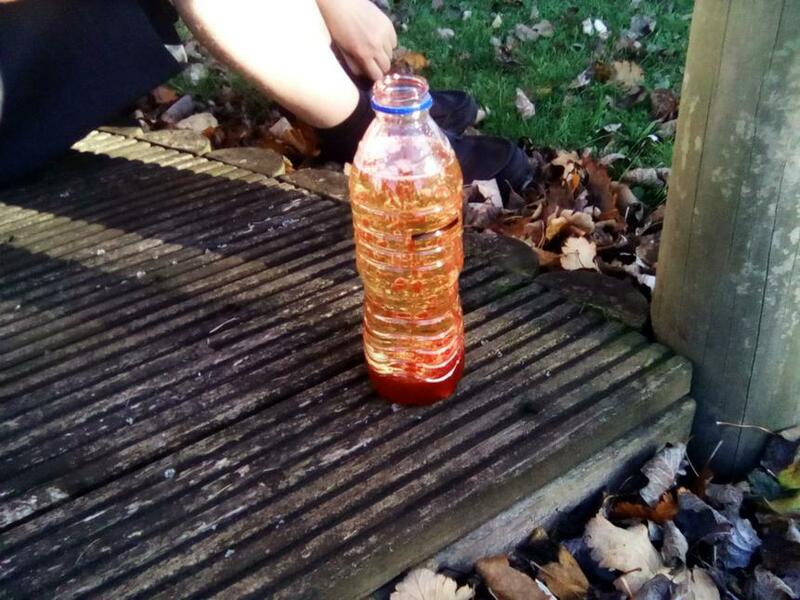 In today’s science club, we made our very own lava lamps! 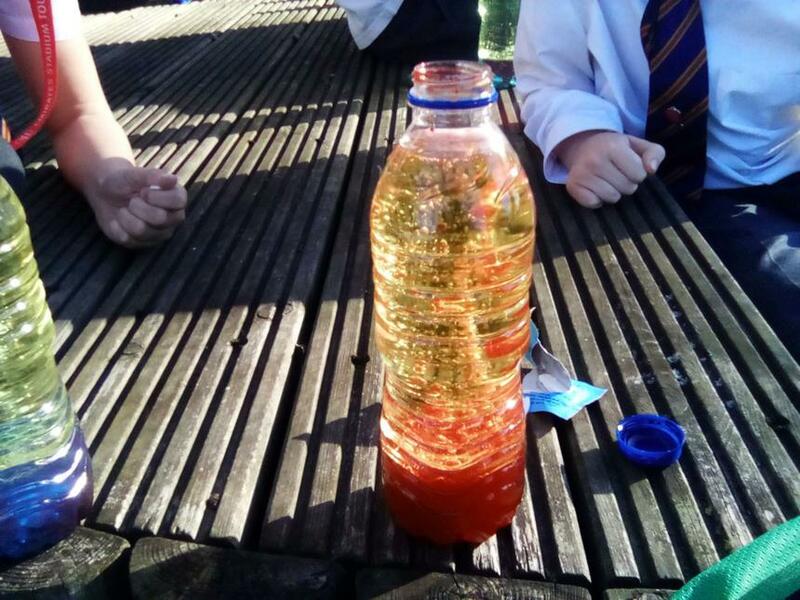 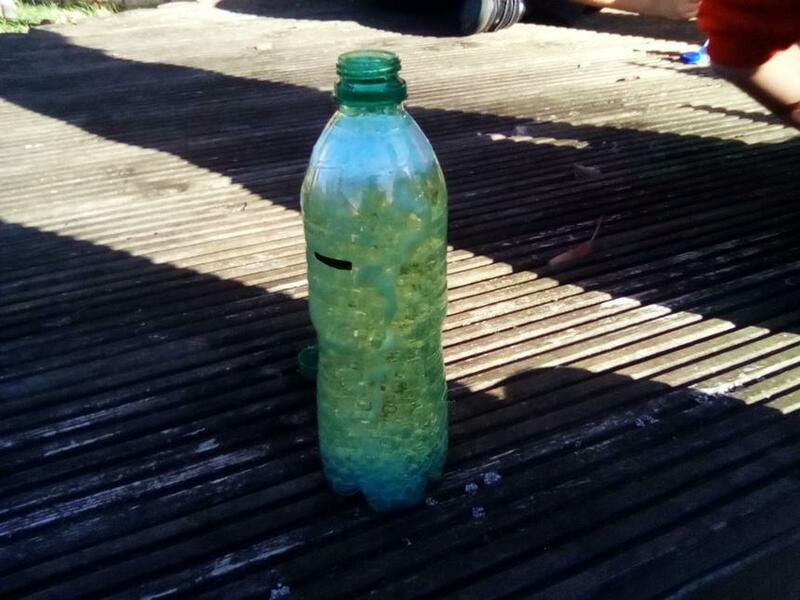 To start with, we had to pour some oil and water into a plastic bottle. 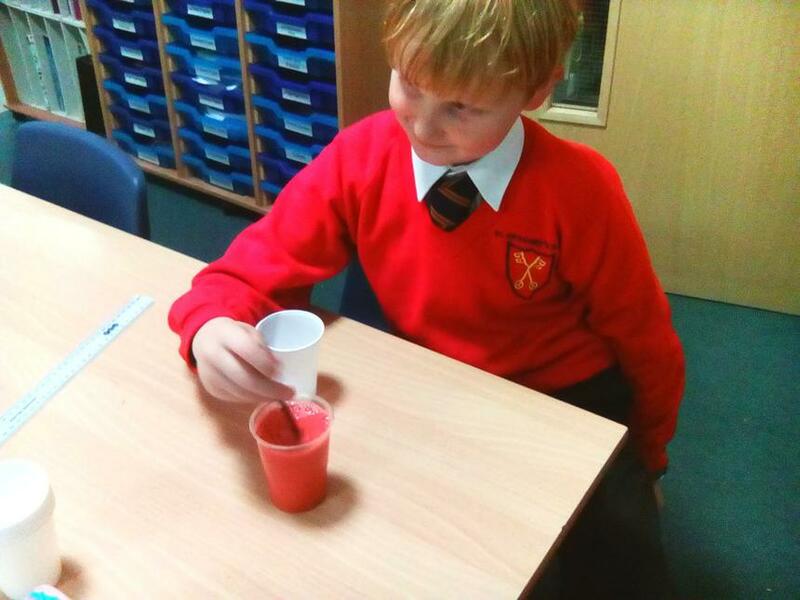 We then added some food colouring to make our lava lamps colourful. 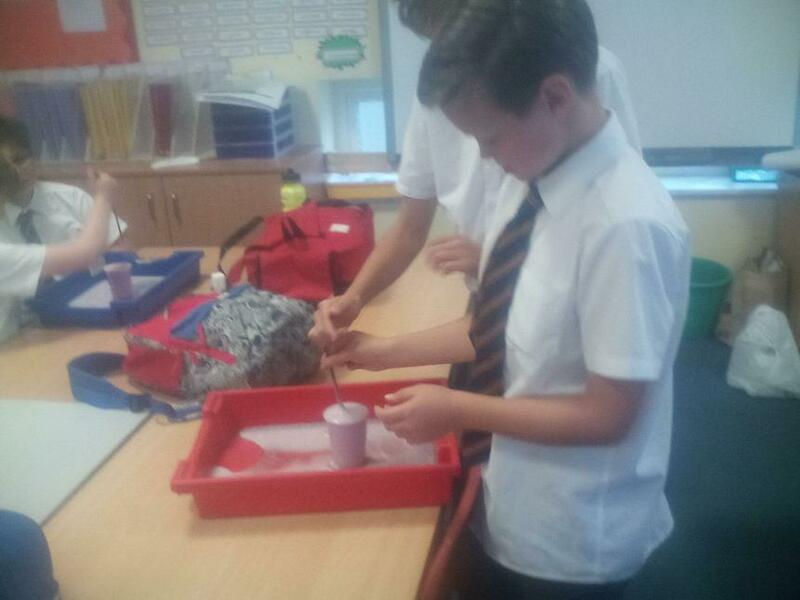 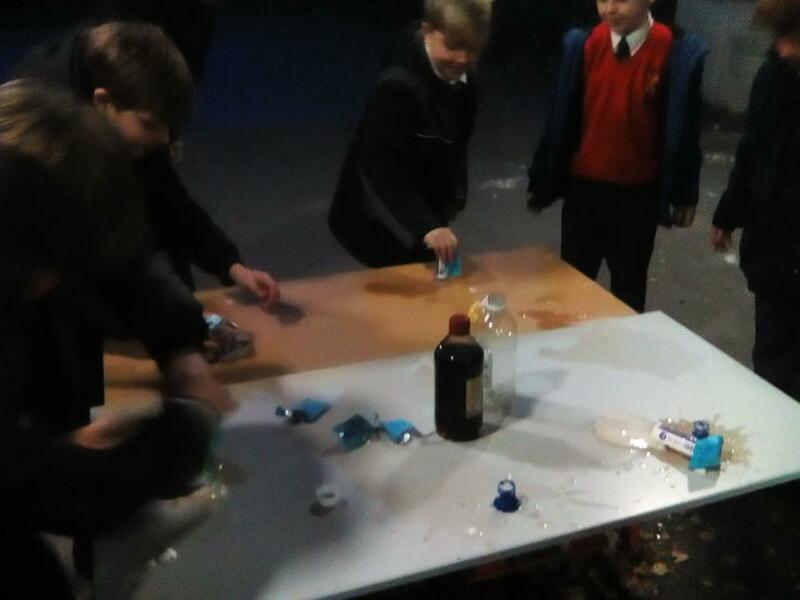 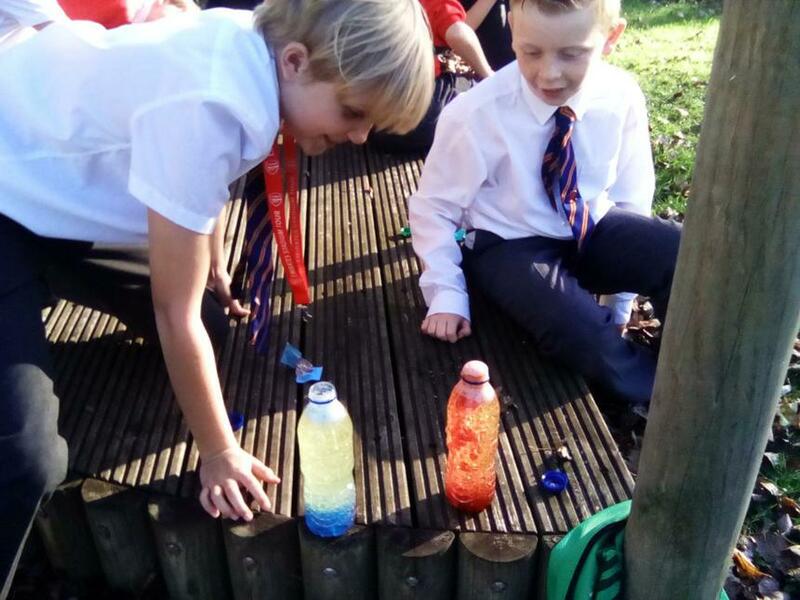 At the very end, we added Alka Seltzer tablets and watched as colourful bubbles were produced, creating the lava lamp effect. 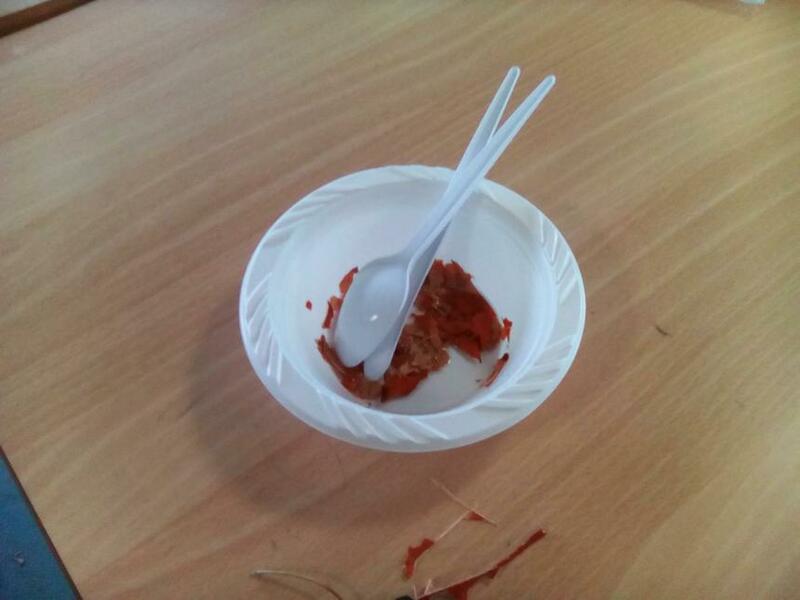 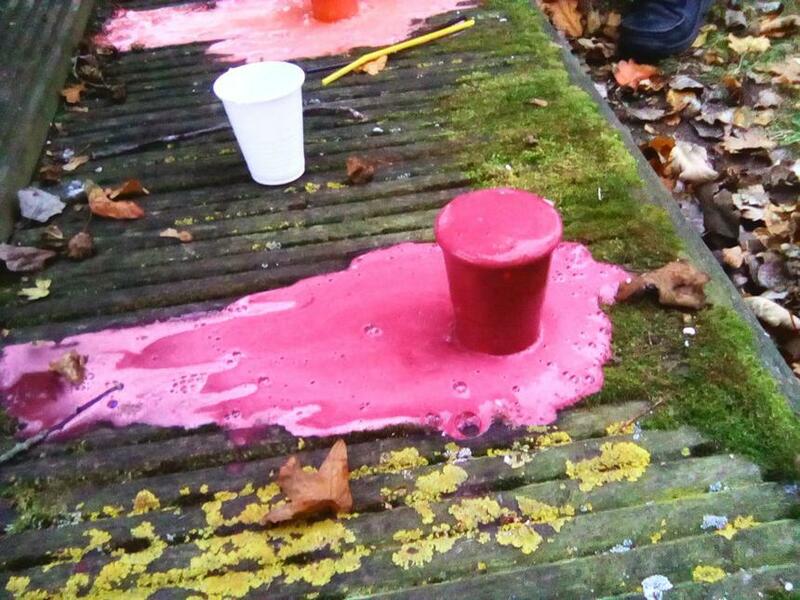 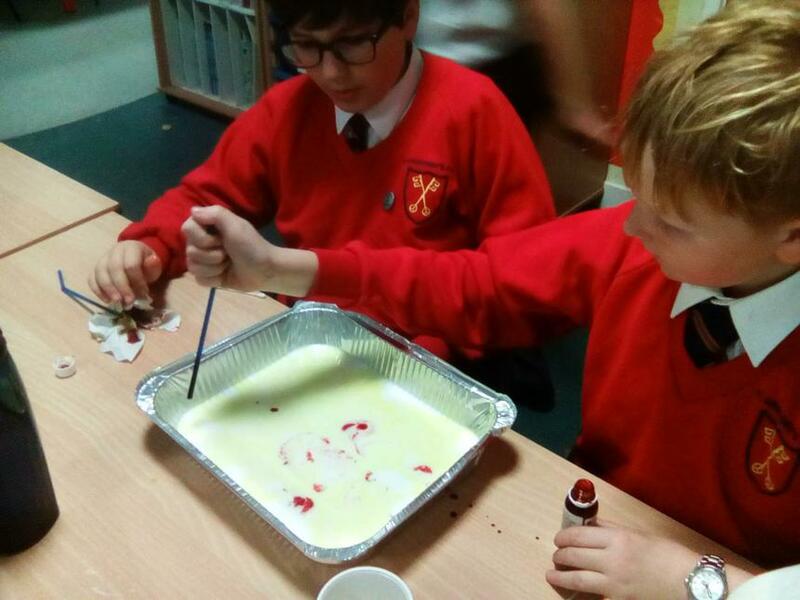 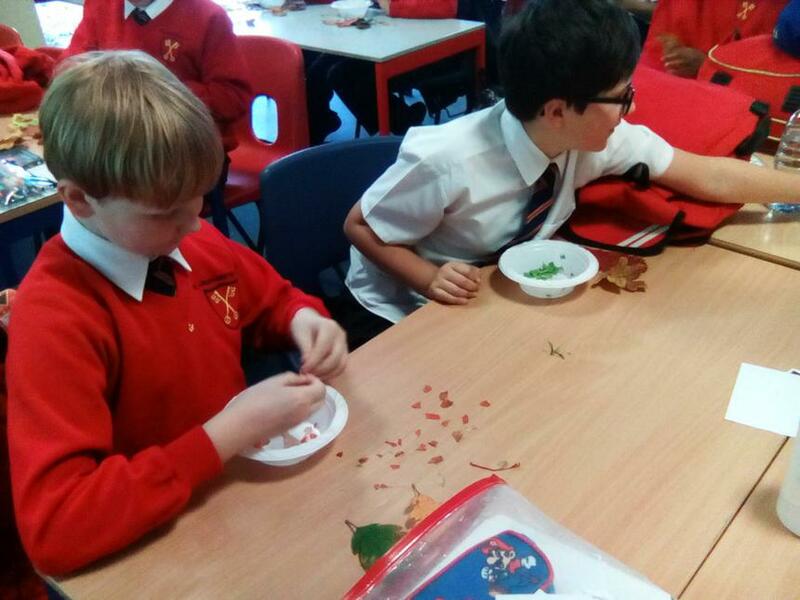 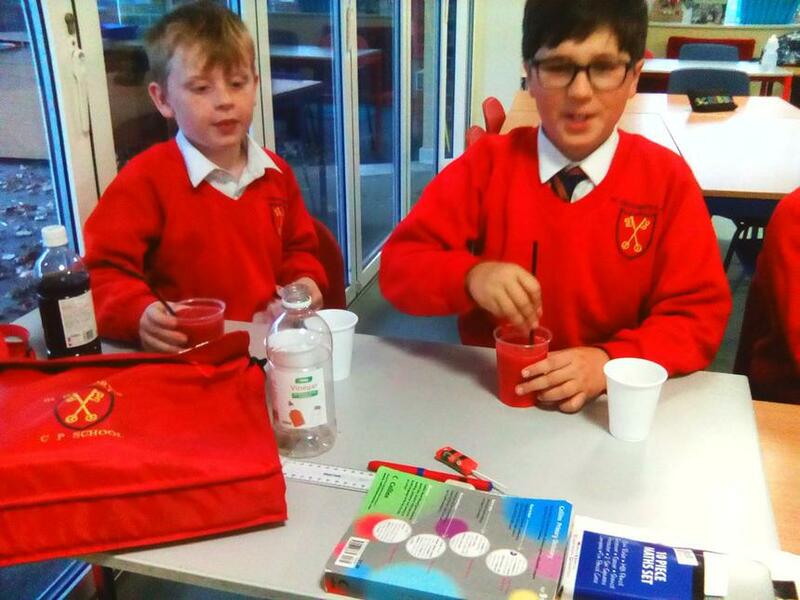 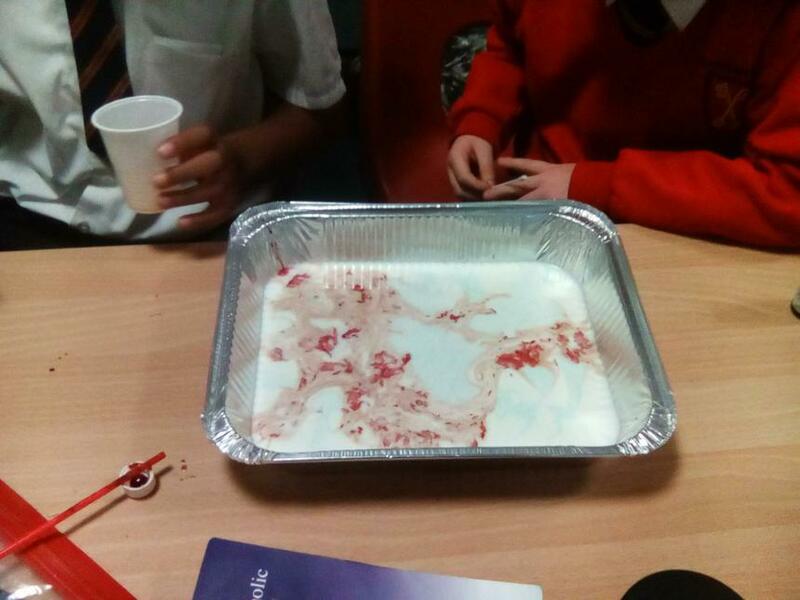 This week, we had great fun creating our very own dragon’s blood potions! 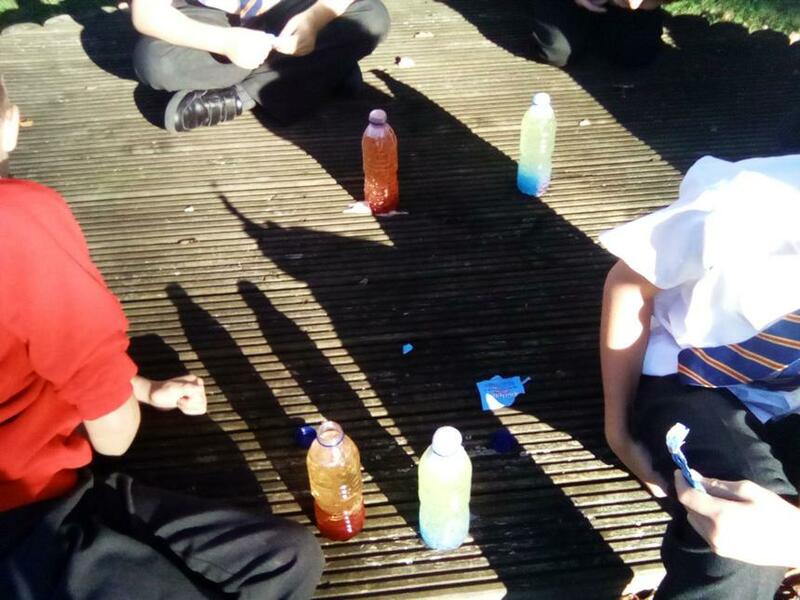 We added the different chemicals and observed the potion changing from a deep red to a cobalt blue colour. 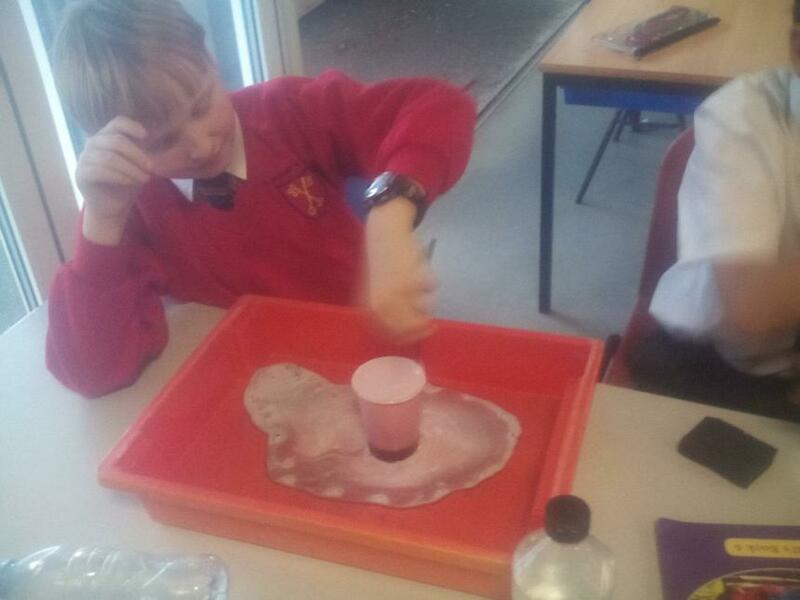 Finally, our potions bubbled up and created a mini volcano effect! 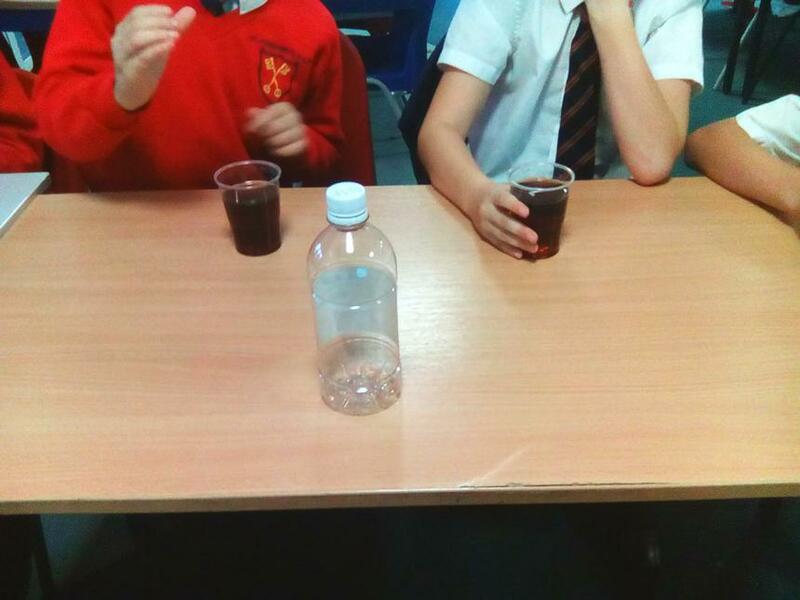 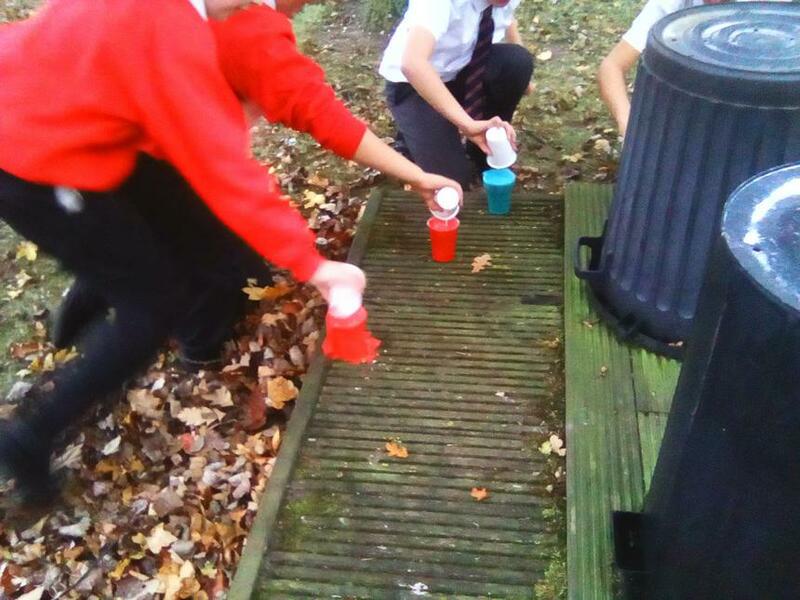 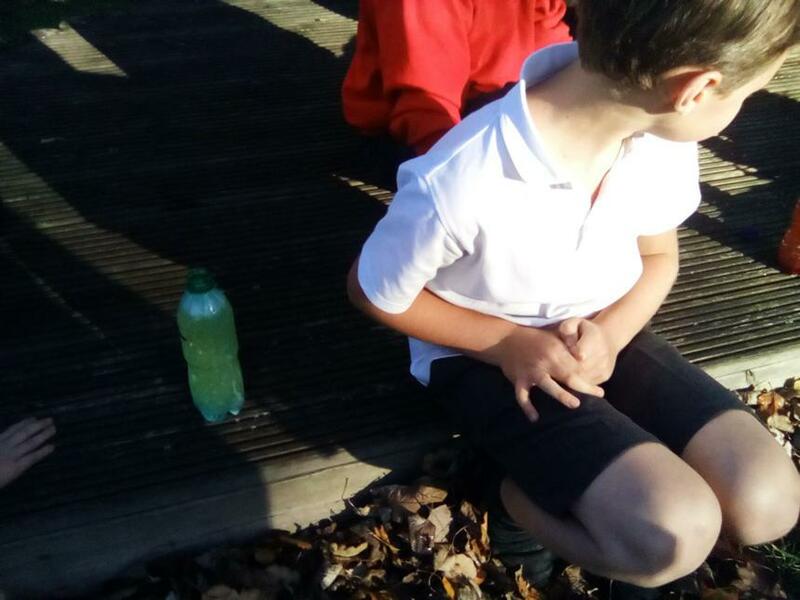 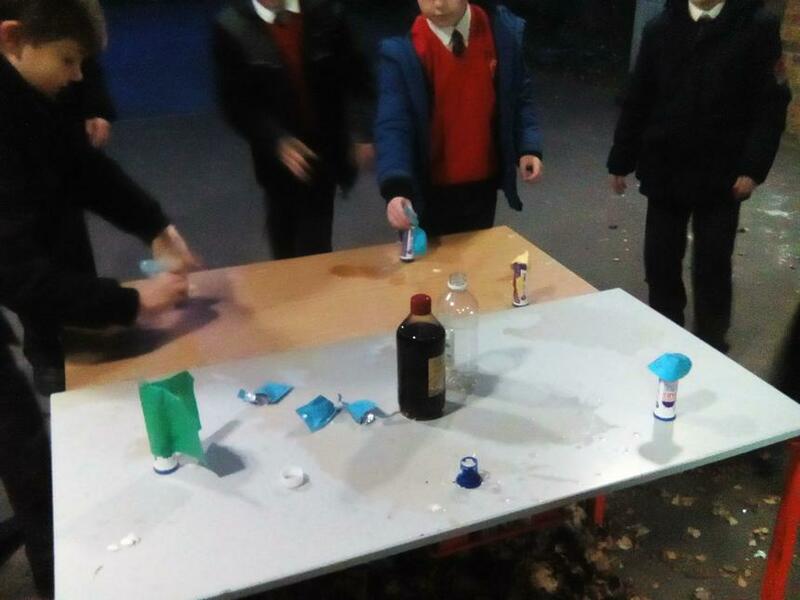 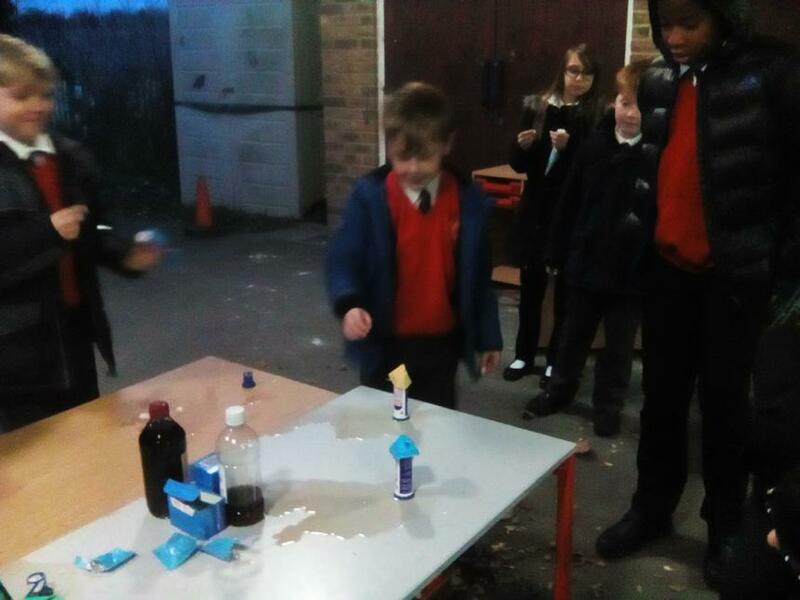 This week, we have been looking into the effects of putting Mentos into Coca Cola. 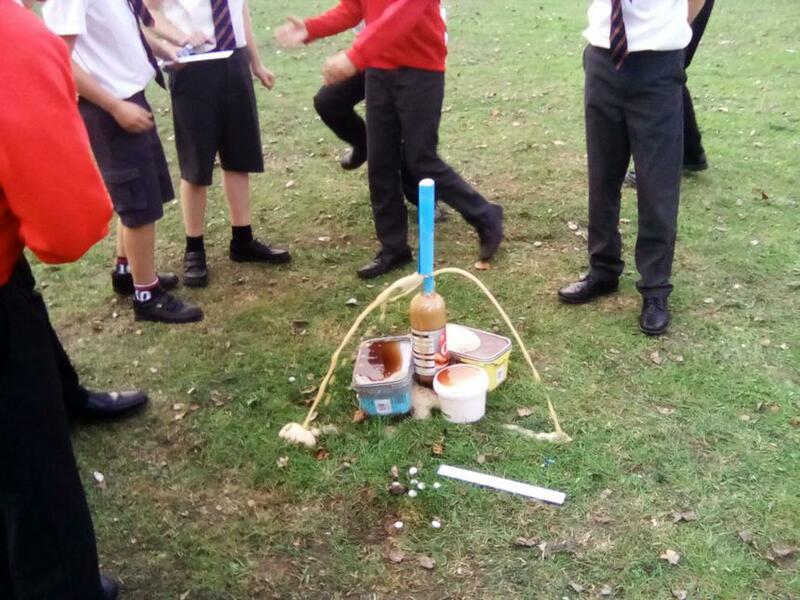 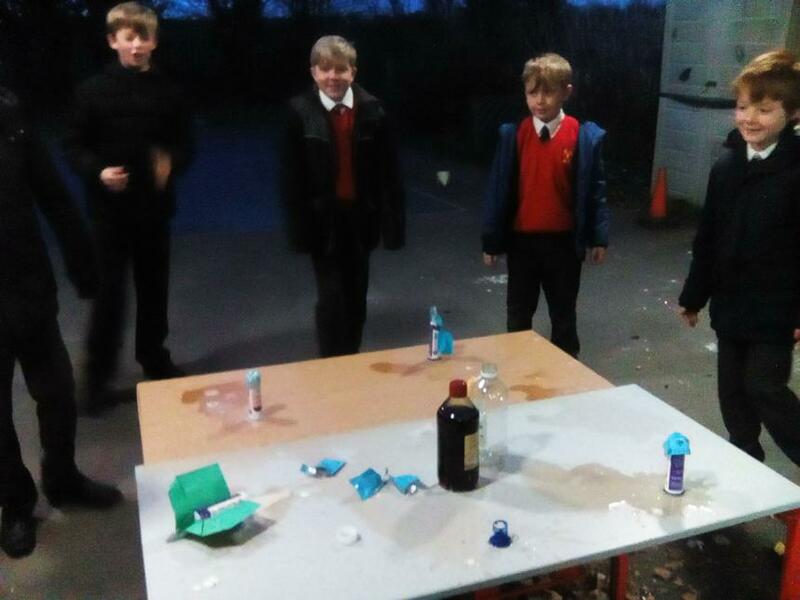 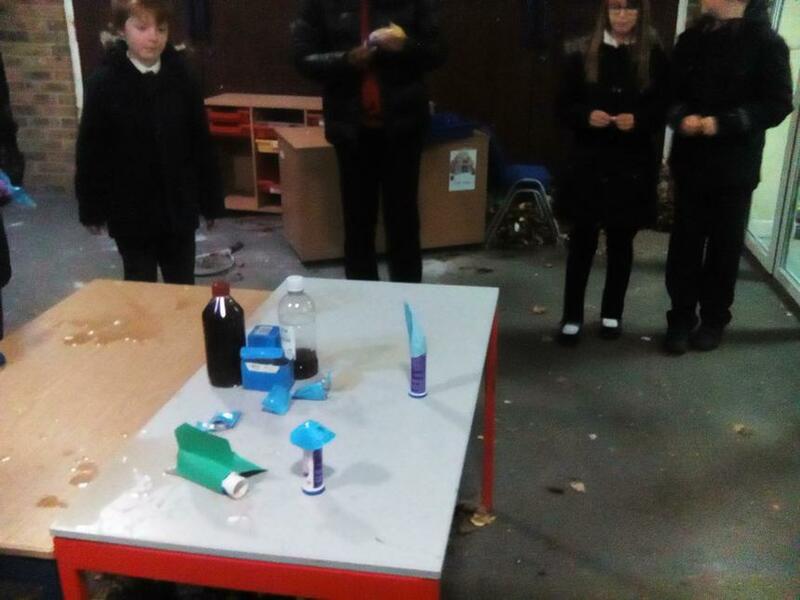 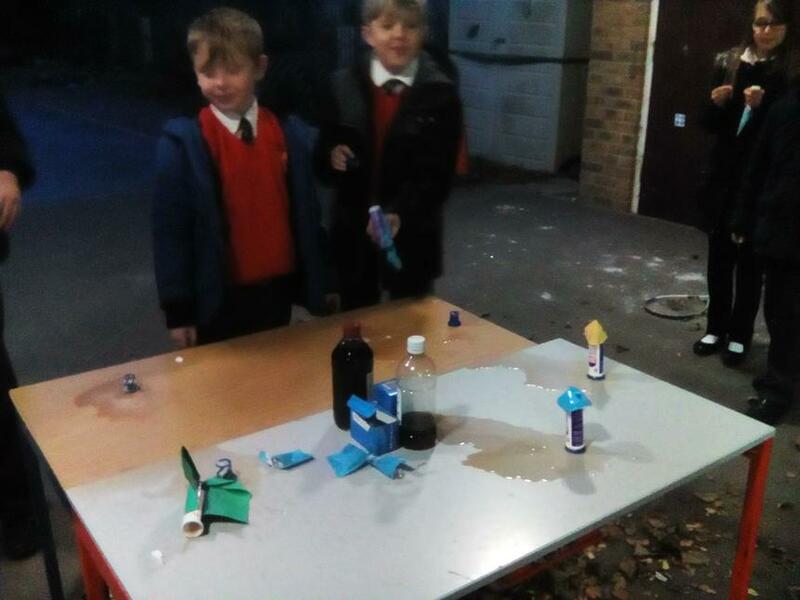 The children made their own 'rockets' from which they used the Mentos as the 'fuel'.